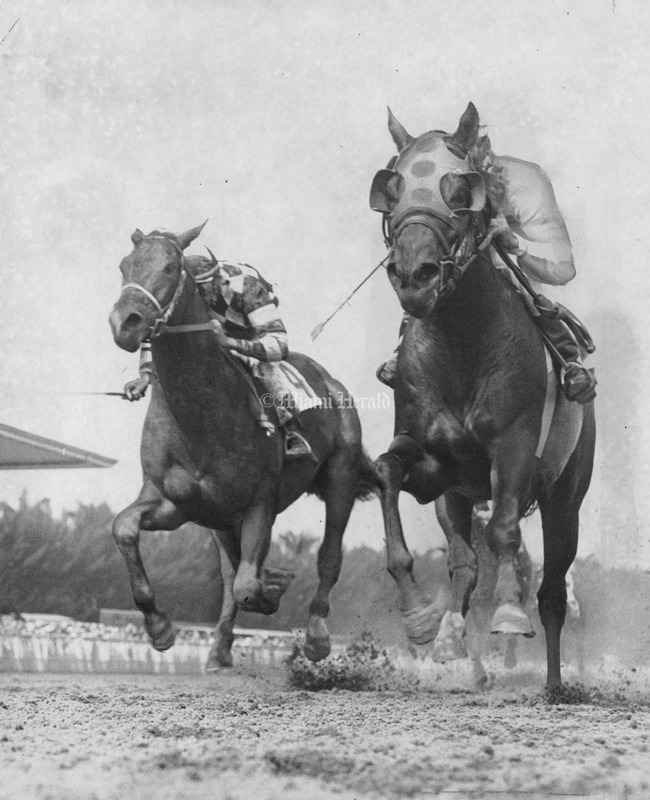 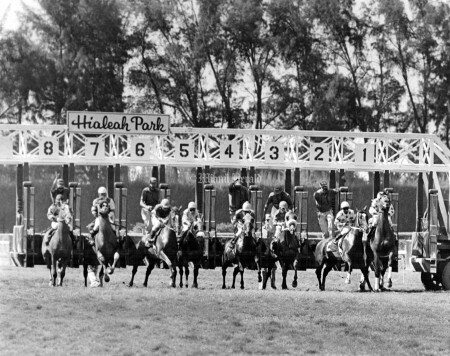 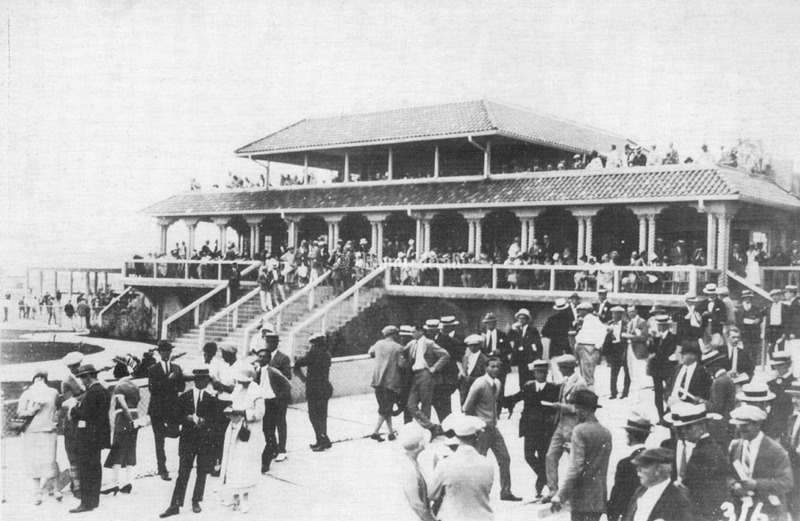 The Hialeah Park Race Track, which opened Jan. 25, 1925, and was closed for two years during World War II, was the site of many racing firsts. 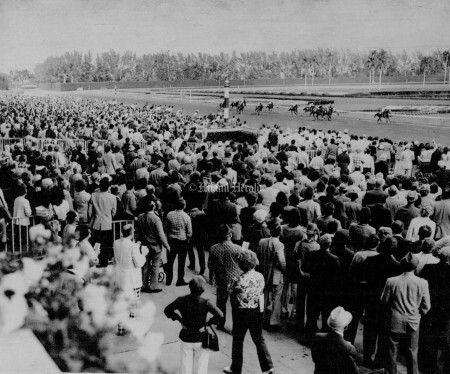 It was the first track in this country to feature a turf course and the first major track at which a female jockey, Diane Crump in 1969, was allowed to compete against males. 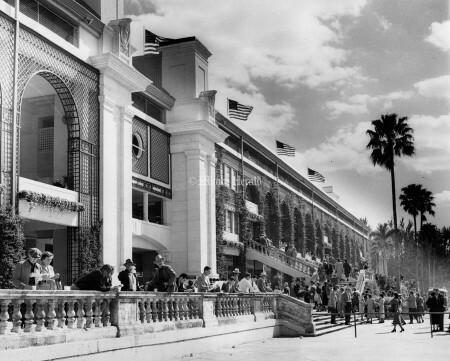 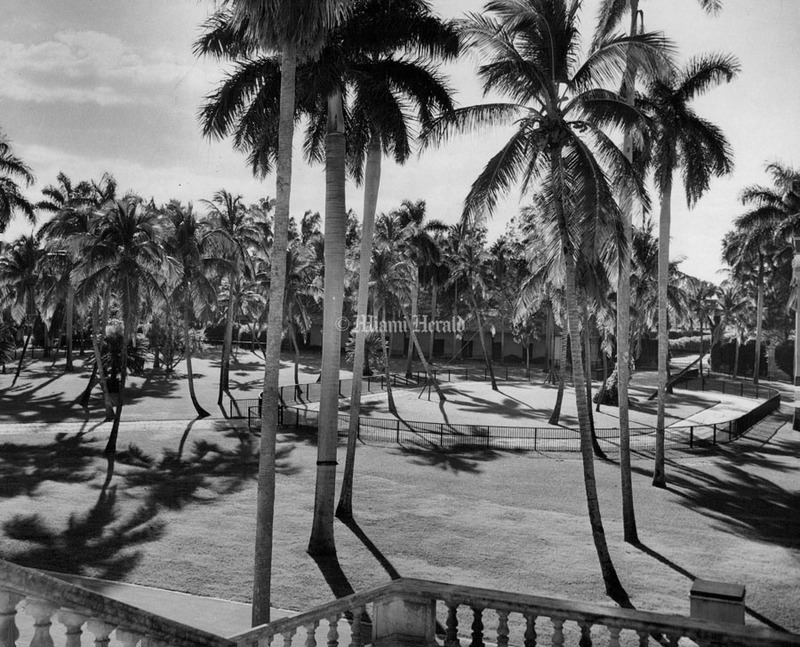 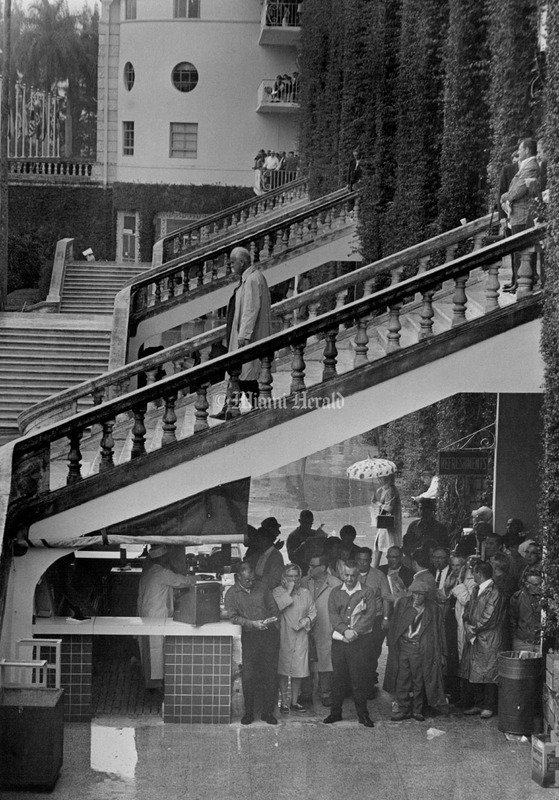 In its day, Hialeah Park was one of America’s most important, and most spectacular, race tracks, built to the finest and highest standards of architecture and landscape design — a place of glamour, status and astounding beauty. Over the years, it was host to some of the nation’s greatest horses — Seabiscuit, Citation and Seattle Slew among them — and at one point, it was designated a wildlife sanctuary for its famous flock of flamingos. 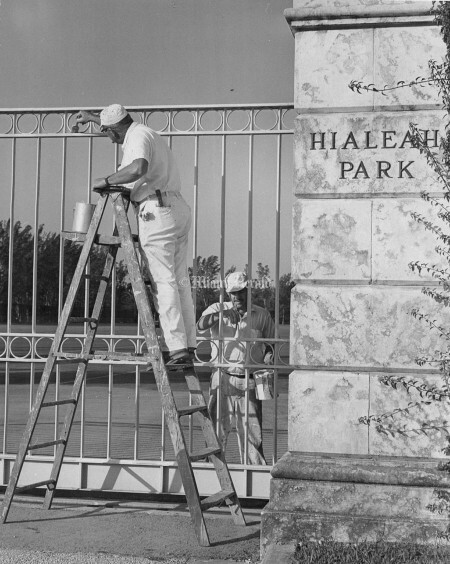 In recent time Hialeah Park lost its preeminency as a race track. 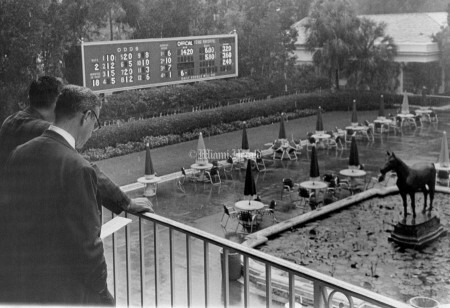 Its last races were run in 2001. 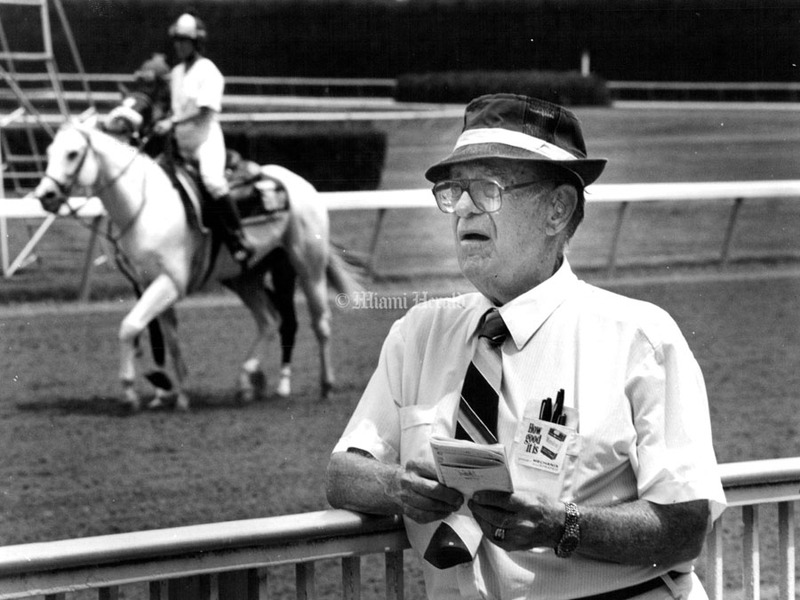 2/19/1984, Al Diaz/Miami Herald Staff: Ed Reddick, 72, visits the track 2-3 times a week. 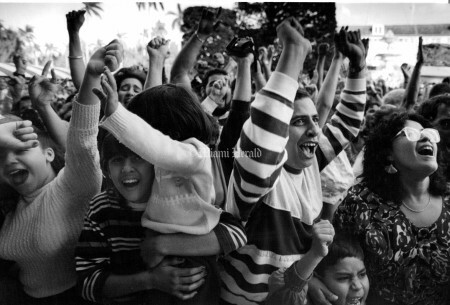 He's also celebrating his birthday. 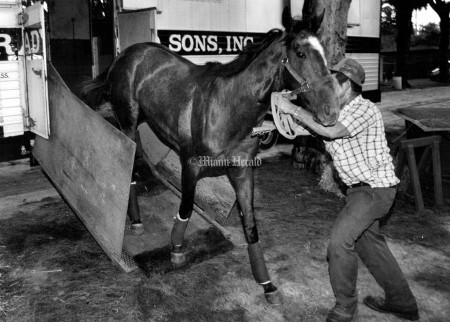 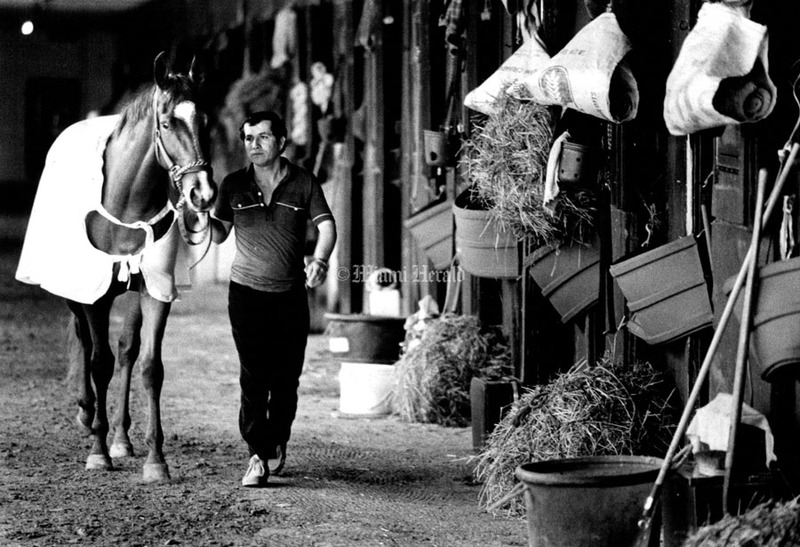 10/16/1991, Brian Smith/Miami Herald Staff: David Salley unloads a horse owned by South Bage farm at Hialeah Race Track. 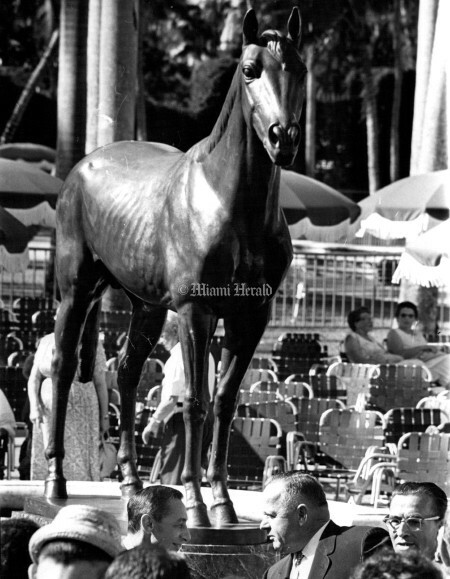 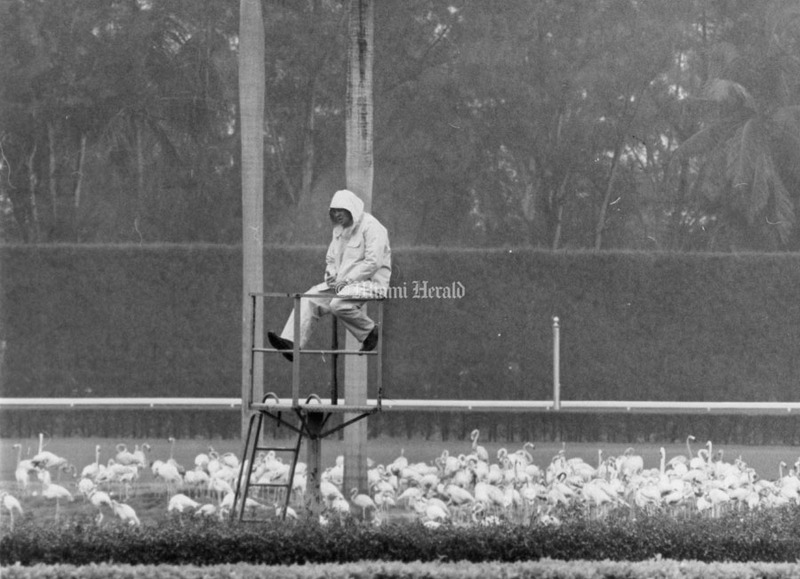 5/6/1993, Jeffery A. Salter/Miami Herald Staff: Dionisio Campo is a Flamingo flusher at Hialeah Park race track. Every weekend he takes this old boat out to flamingo Island to get the birds flying. Charles Stevens, Walter and his brother Eddie Dettmann share a program while checking upcoming race. 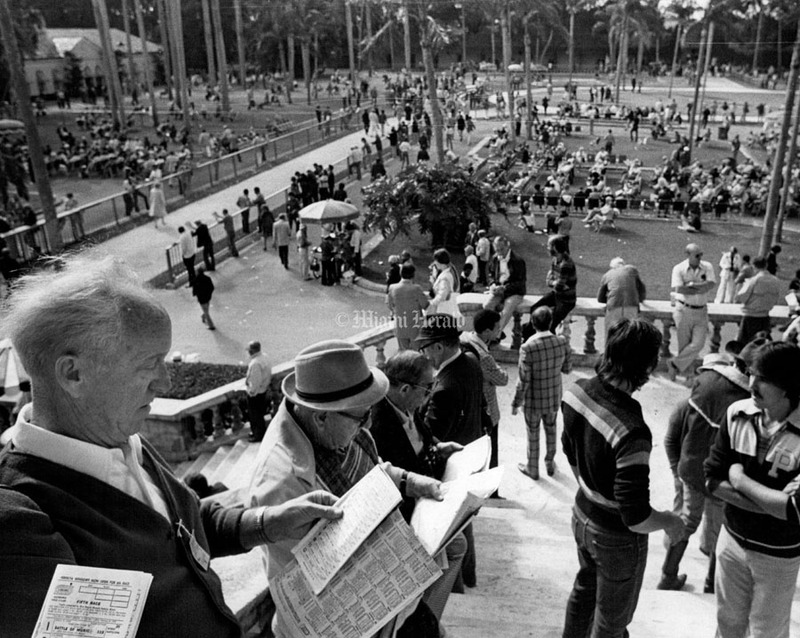 3/17/1994, Carl Juste/Miami Herald Staff: Edward Brown, 61, remembers the good old days when the park was full of horse racing enthusiasts. 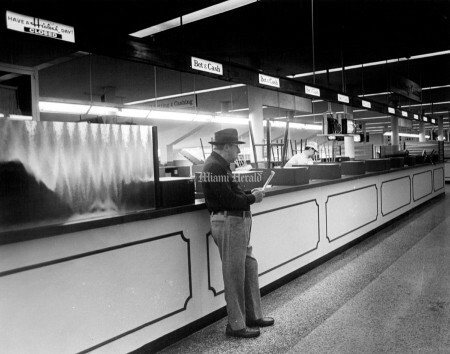 He is retired from the catering business, and is still involved with horse racing as a part-time hot walker. 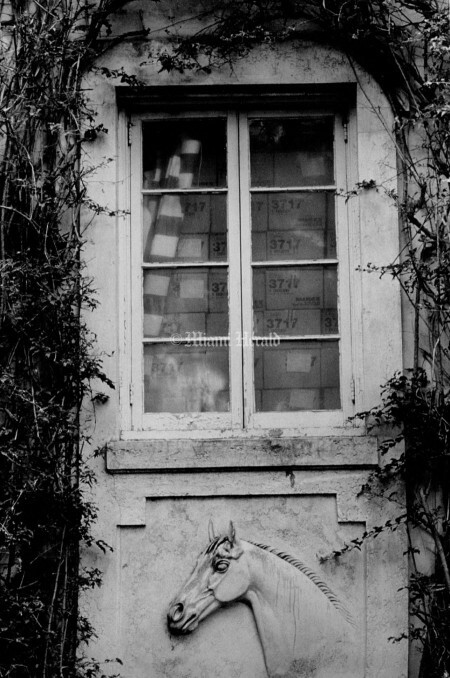 He sits and reads the racing program. 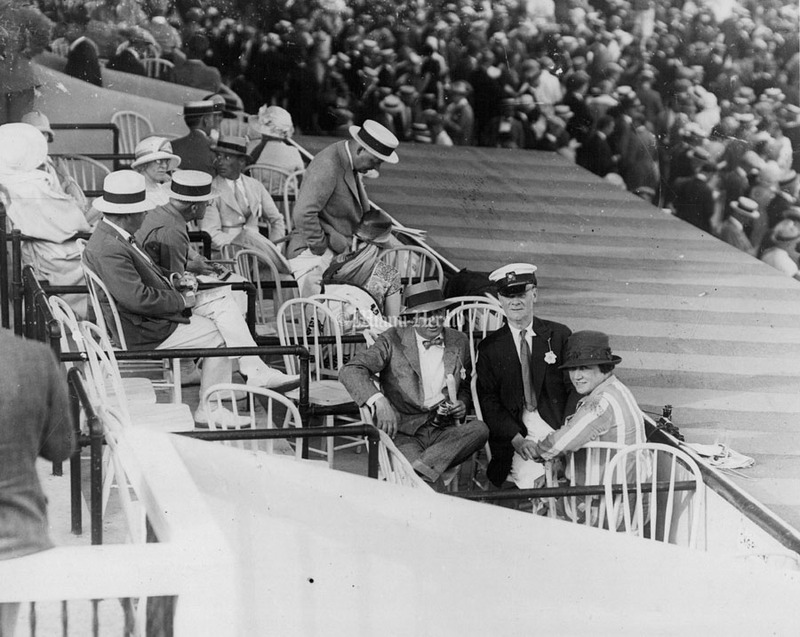 Around him are empty seats, attendance was very low for opening day. 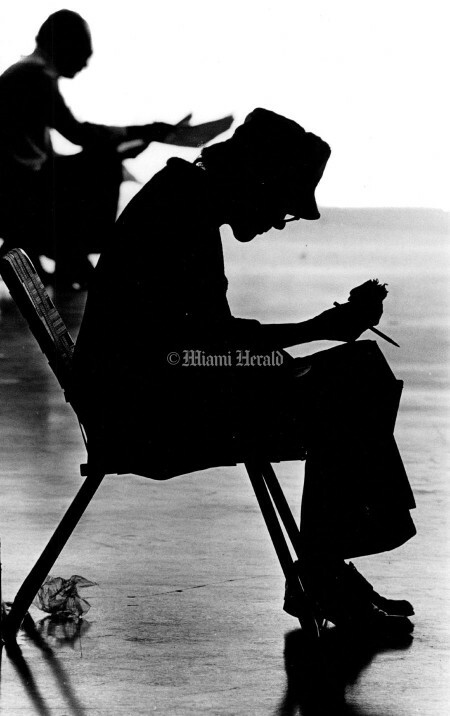 2/1/1969, Jim Rafferty/Miami Herald Staff: THE HEIR (no. 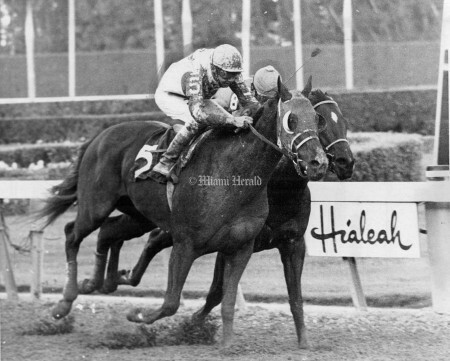 7) finished 2nd with Braulio Baeza in the stirrups but faltered shortly after the finish and dropped dead. 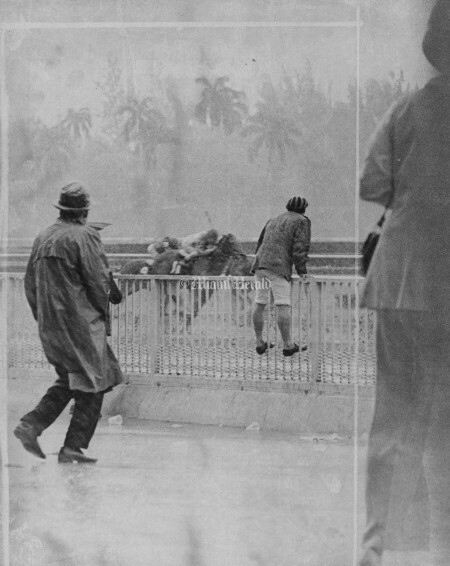 Baeza was shaken up in the mishap and cancelled remaining mounts on the program. 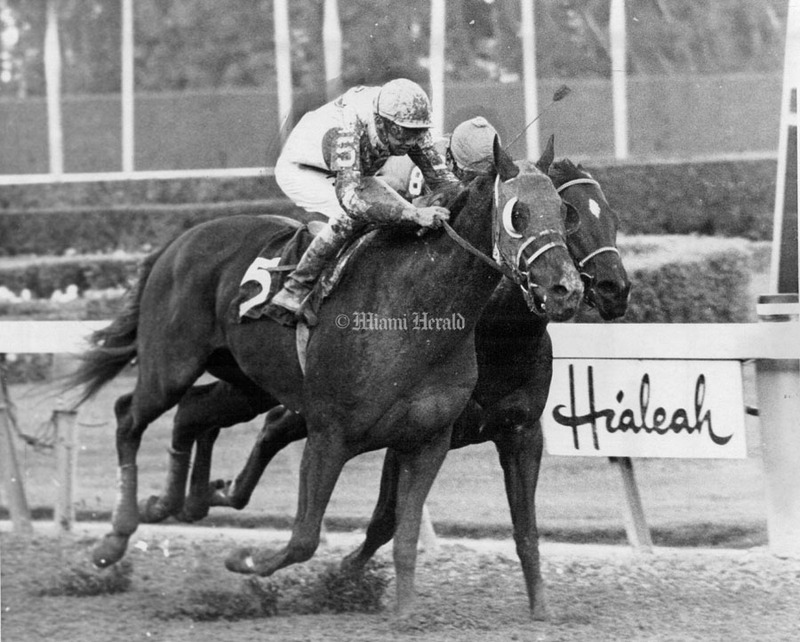 THE HEIR he owned by Wheatley Stable and trained by Eddie Neloy, was a nominee for the $100,000 Flamingo Stakes. 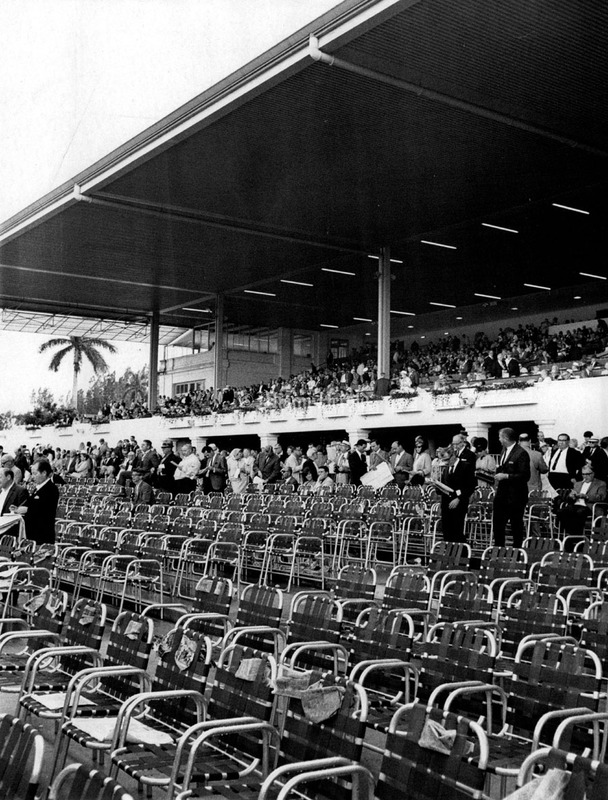 1/17/1967, Bill Kuenzel/Miami Herald Staff: Hialeah Horse Race Track. 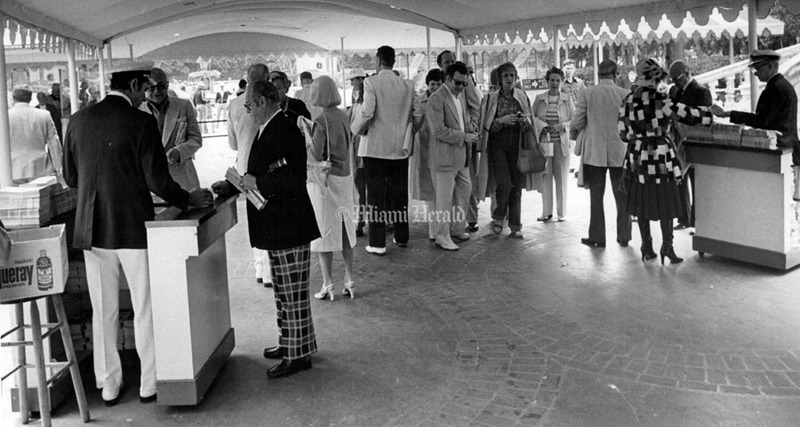 2/26/1984, Al Diaz/Miami Herald Staff: A woman eats lunch at Hialeah Race Track. 1/21/1982, Miami Herald Staff: Fred and Jennifer Greenberg. 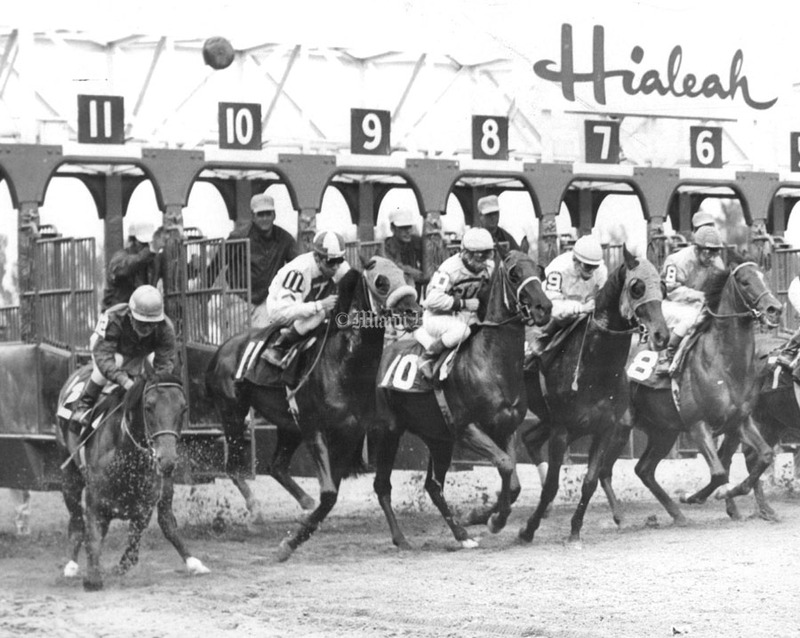 1/1/1968, John Pineda/Miami Herald Staff: Hialeah Horse Race Track. 1/15/1984, Carol Guzy/Miami Herald Staff: Luis Isaias Rodriguez at the betting counter at Hialeah race track. 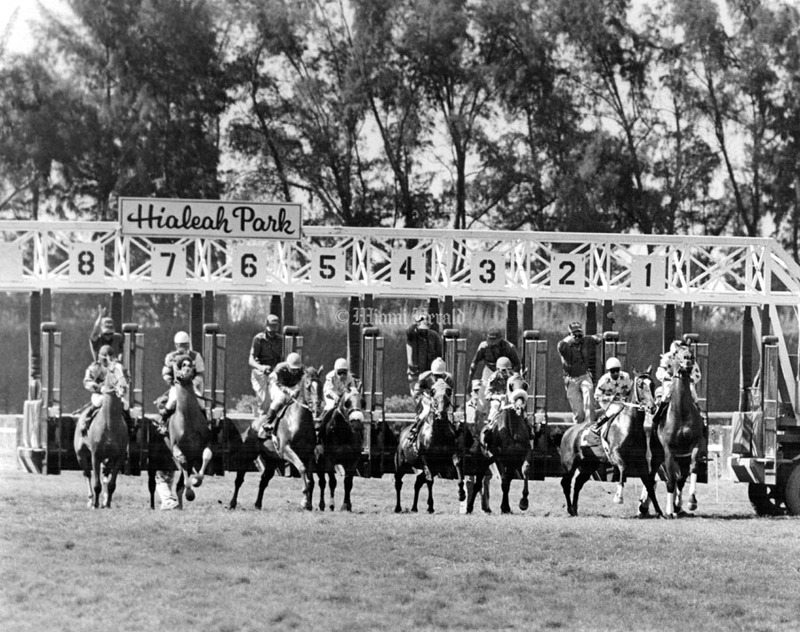 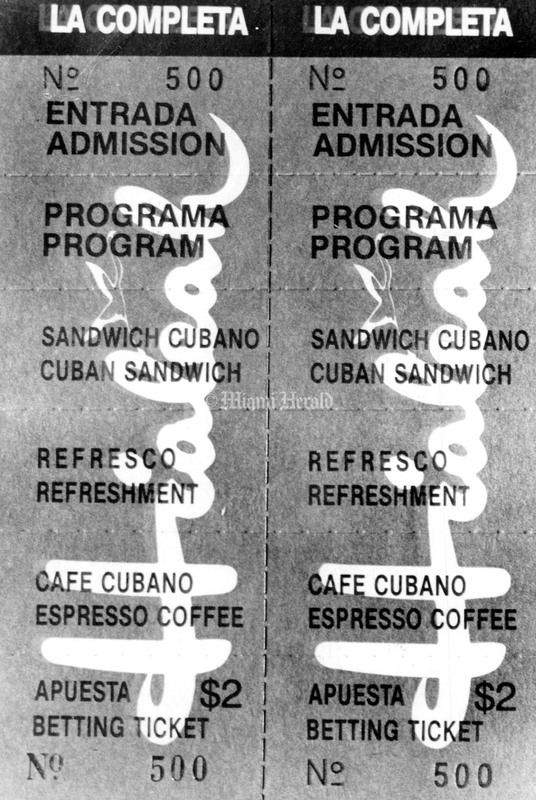 Undated: Entry ticket for Hialeah Race Track. 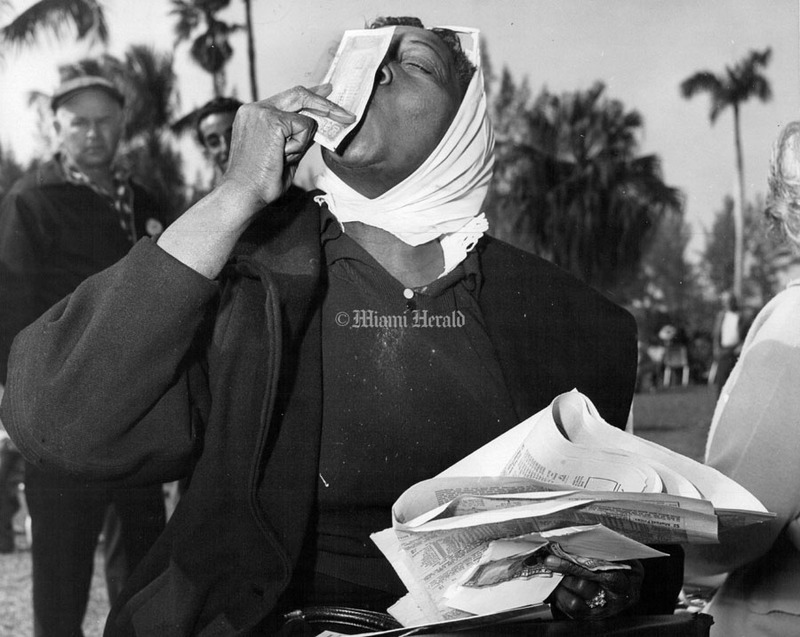 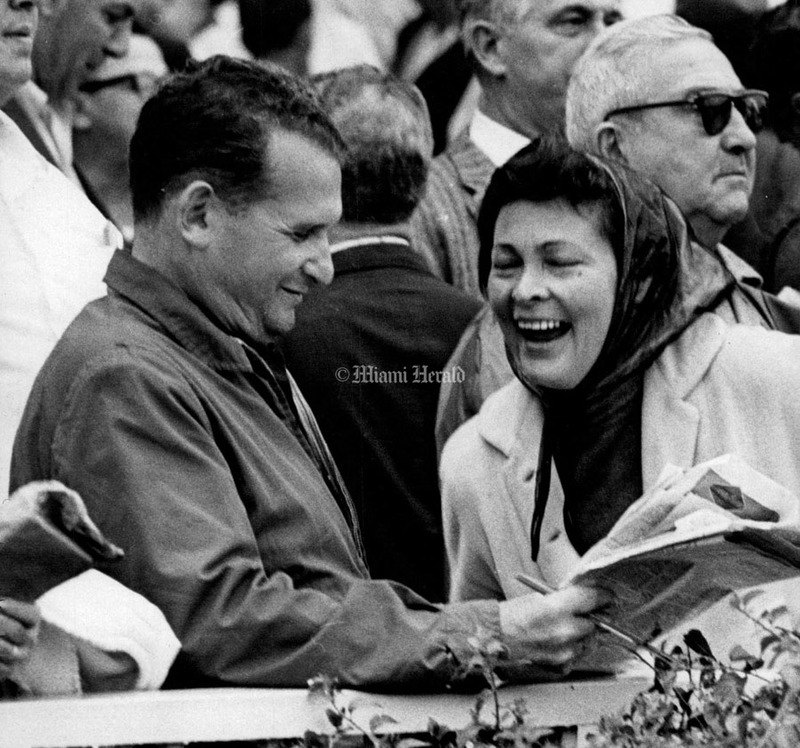 1/16/1964, Miami Herald Staff: A WELCOME KISS is planted on a $20 bill by Mrs. Jeff Adams of Jacksonville after she became one of 30 bettors in the $2 grandstand betting line to receive such a gift from President Saul Silberman of Tropical Park. 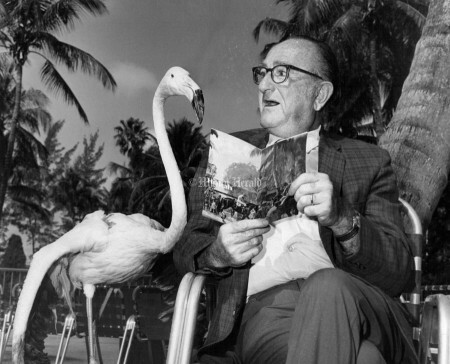 Silberman, who'll pass out 30 more such $20 bills at today's closing, says it is in appreciation of "a splendid season." 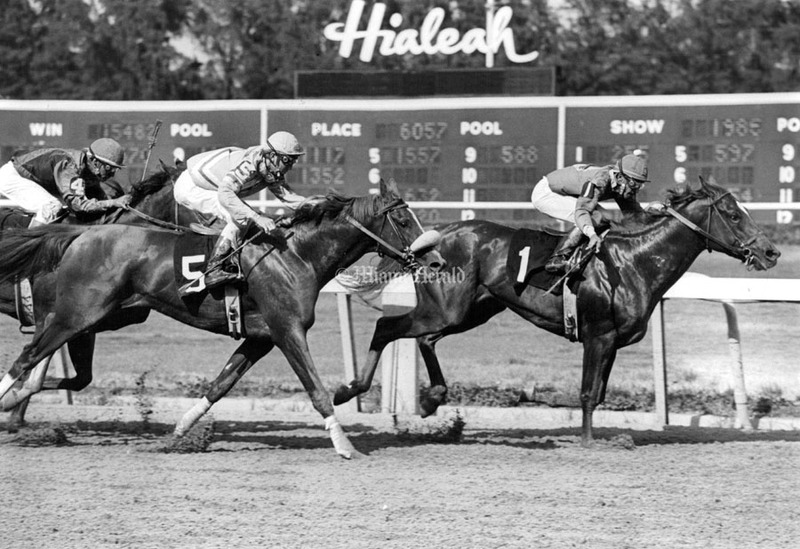 1/1/1968, John Pineda/Miami Herald Staff: Hialeah Race Track. 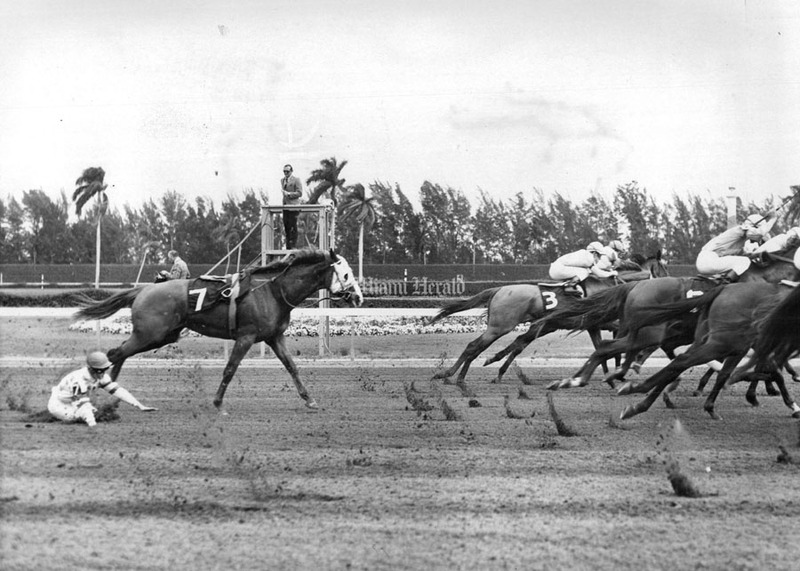 1/11/1960, Miami Herald Staff: Hialeah Race Track. 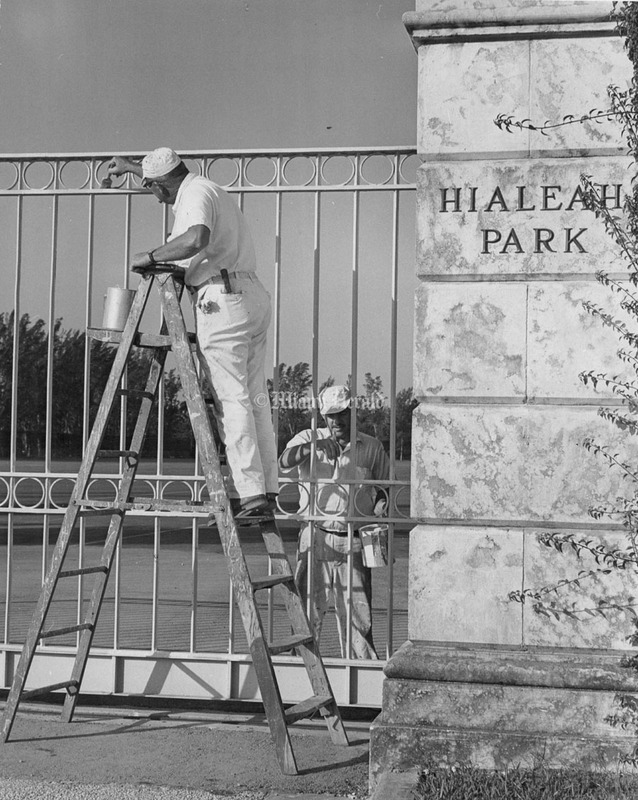 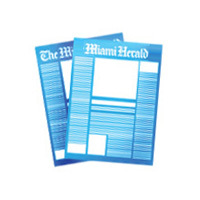 1/17/1966, Joe Lippincott/Miami Herald Staff: Bench Strength: Hialeah Team busy with last-minute arrangements. 1/16/1970, Gus Schuettler/Miami Herald Staff: Man picking days winners. 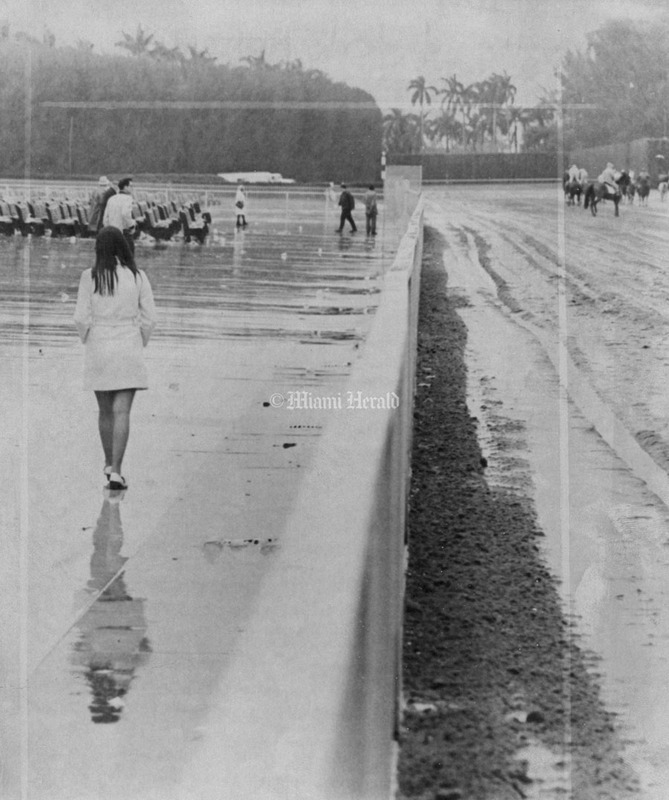 1/11/1969, Miami Herald Staff: Hialeah Horse Race Track. 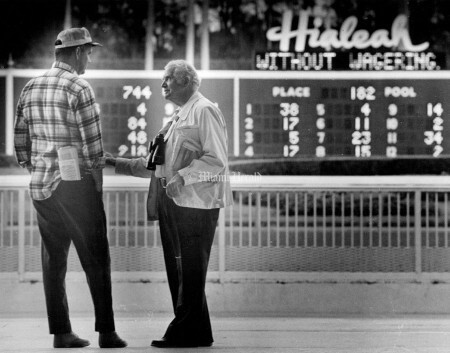 2/7/1970, John Walther/Miami Herald Staff: Hialeah Horse Race Track. 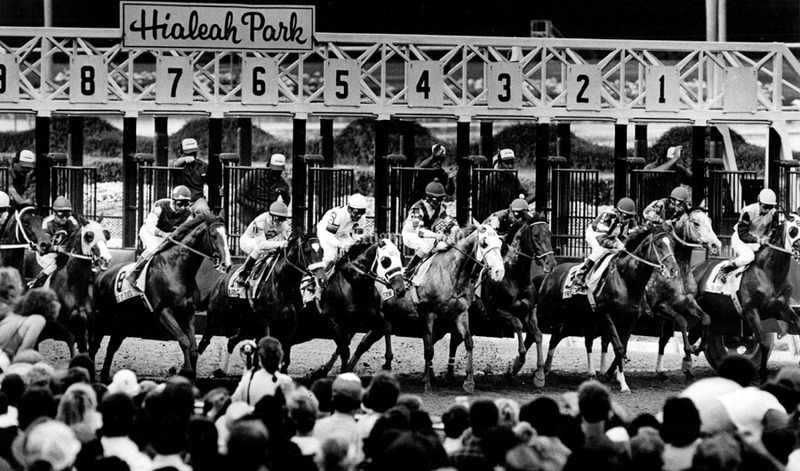 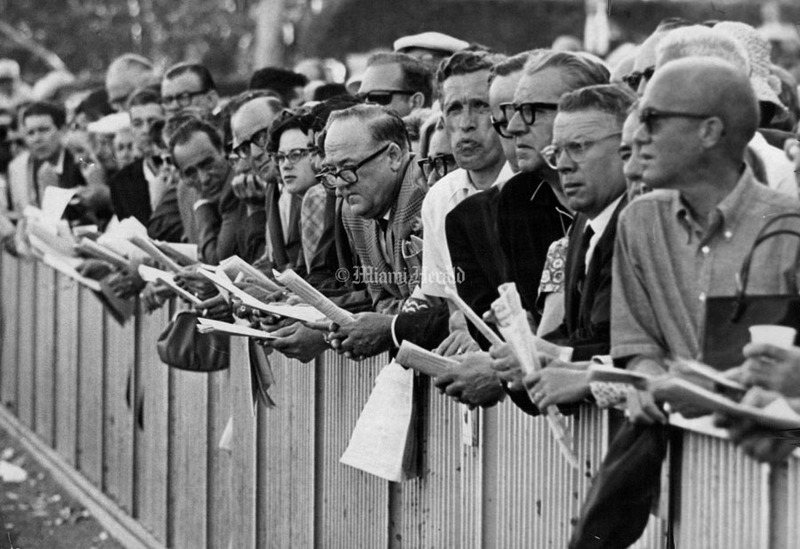 1/16/1965, Miami Herald Staff: Hialeah Horse Race Track. 1/24/1970, Joe Schuppe/Miami Herald Staff: Place in the sun at Hialeah. 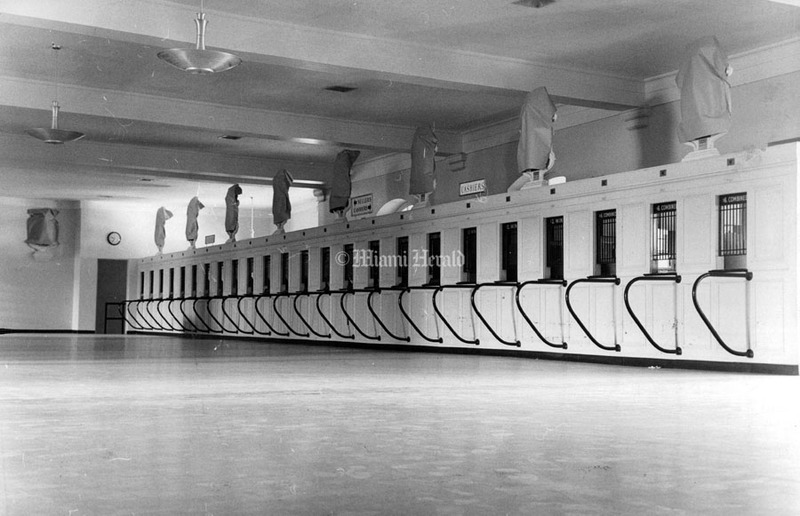 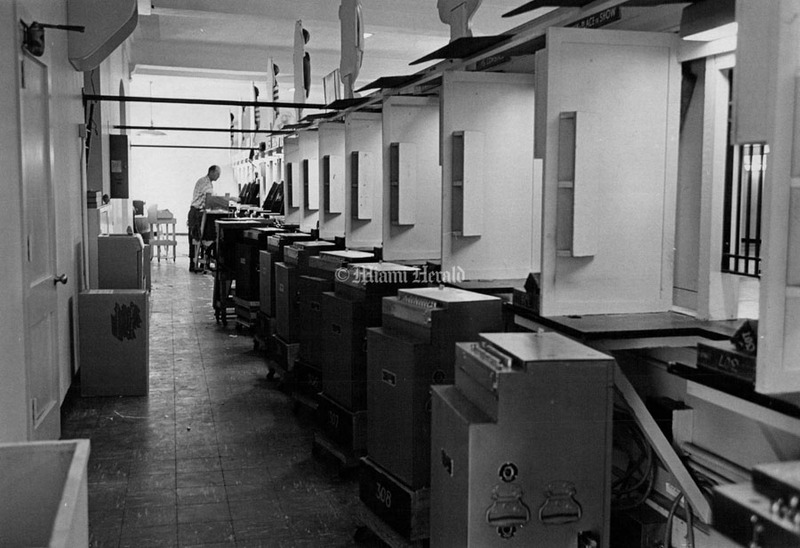 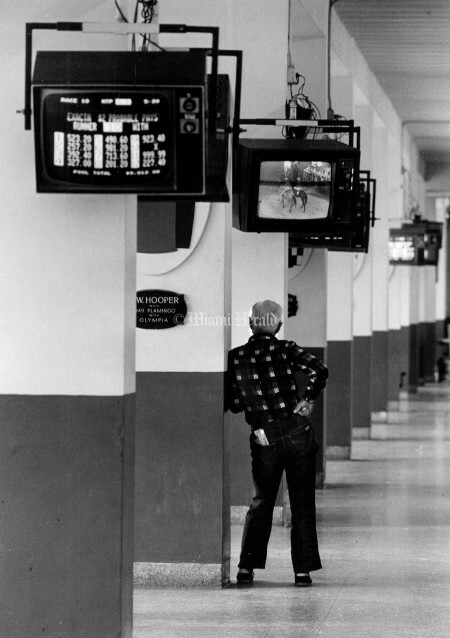 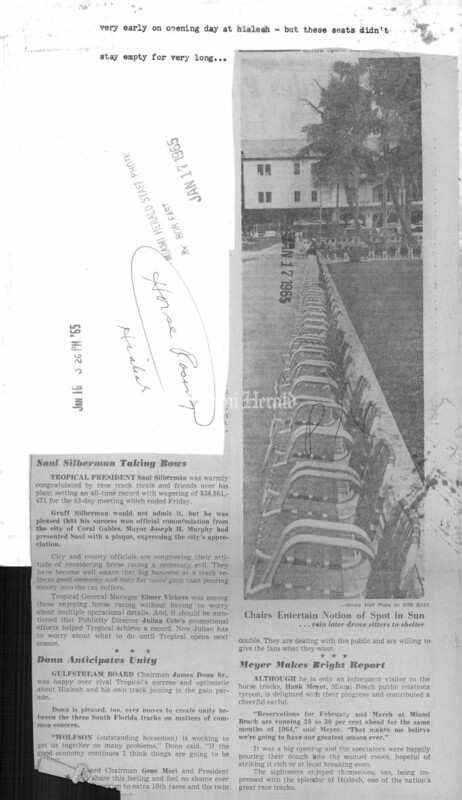 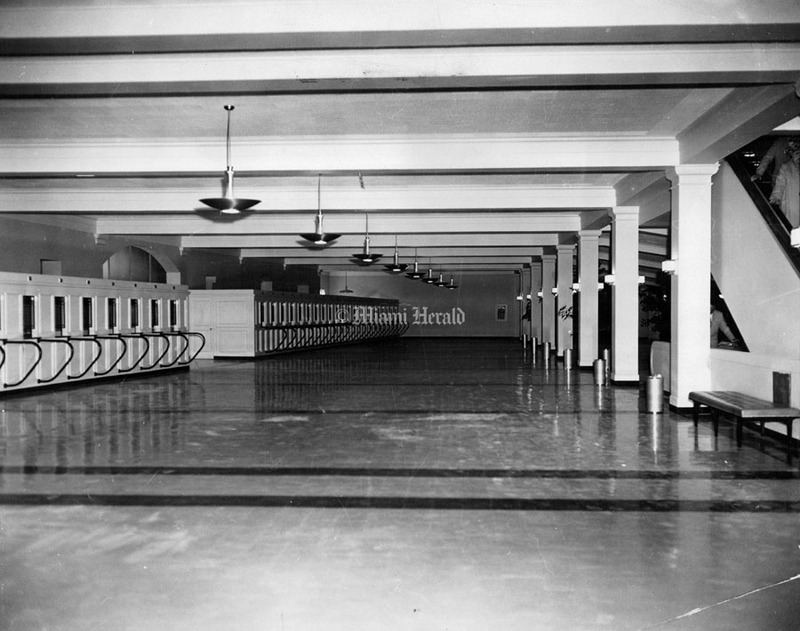 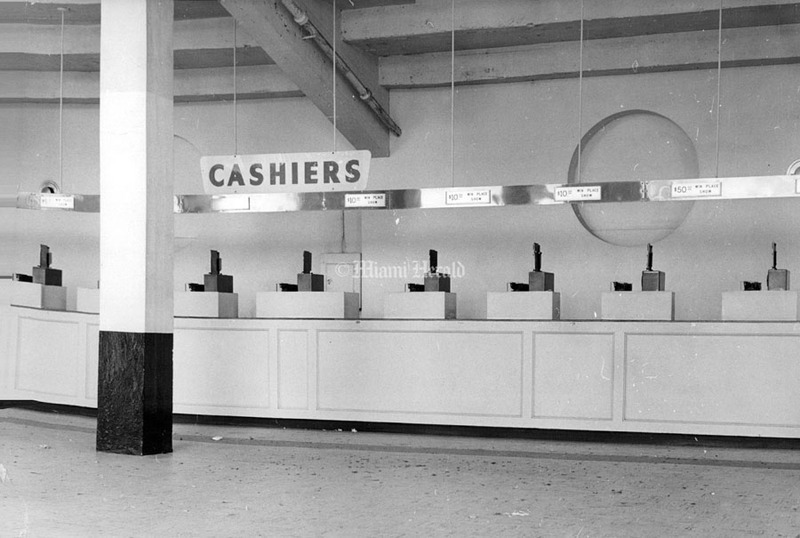 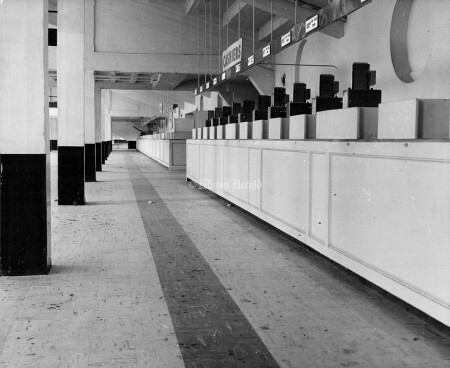 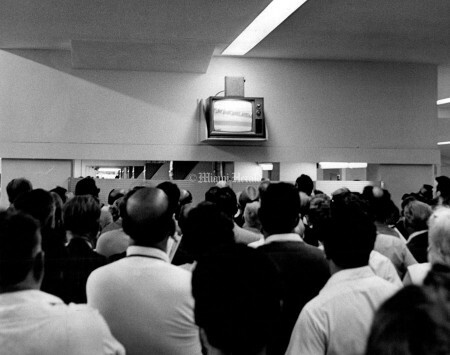 1/16/1968, Miami Herald Staff: Racing entry room - empty at 11:07 AM after entry time had been extended. 1/26/1967: Horse track - Hialeah. 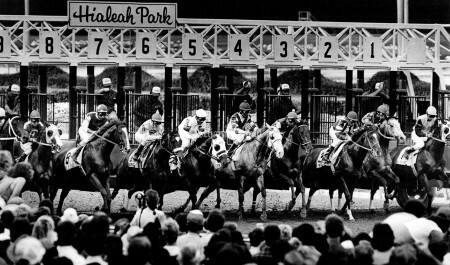 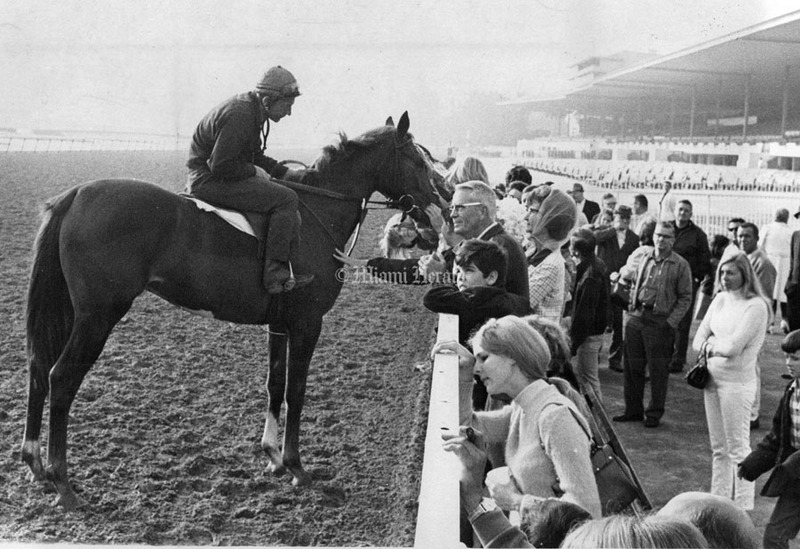 1/18/1968, John Pineda/Miami Herald Staff: Hialeah Horse Race Track. 1/17/1968, John Pineda/Miami Herald Staff: Lt. W.J. 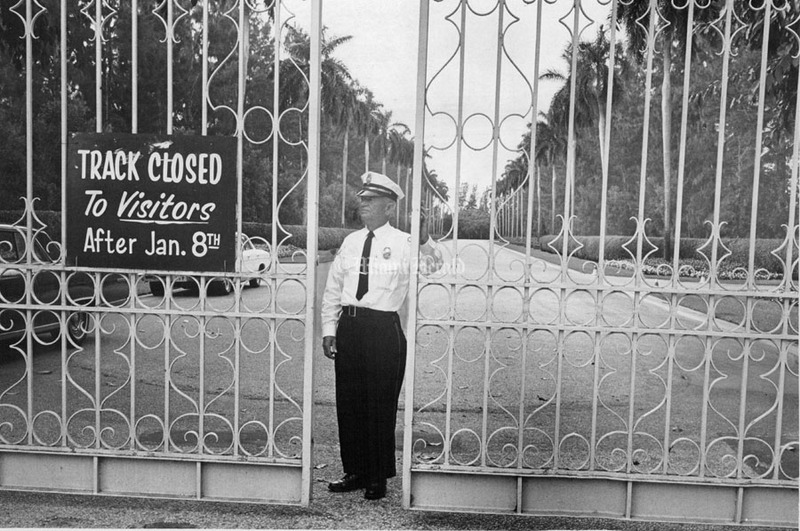 Burgess guards gate at Hialeah Race Track. 1/18/1969, John Pineda/Miami Herald Staff: Hialeah Race Track. 1/1/1967, Bill Kuenzel/Miami Herald Staff: Hialeah Race Track. 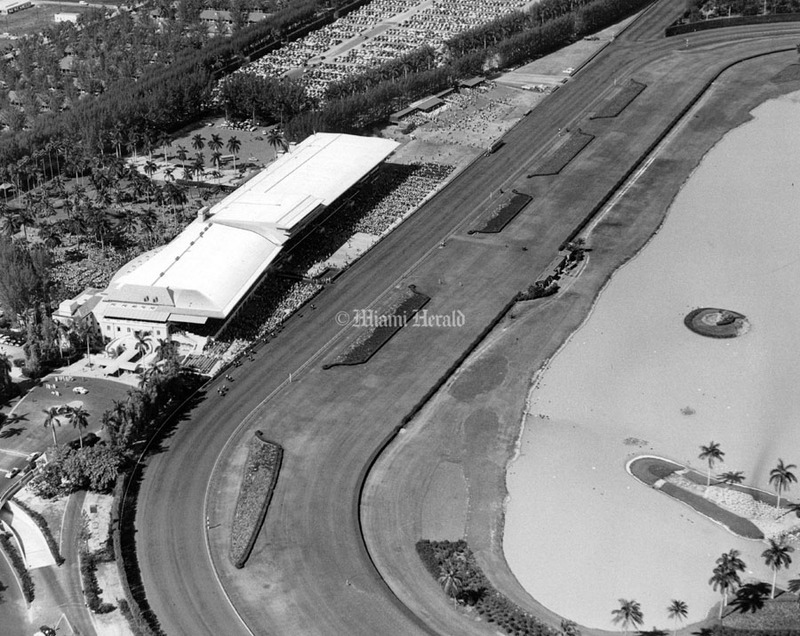 1/21/1967, Bob East/Miami Herald Staff: Hialeah Race Track. 2/4/1967, Bill Sanders/Miami Herald Staff: Hialeah Race Track. 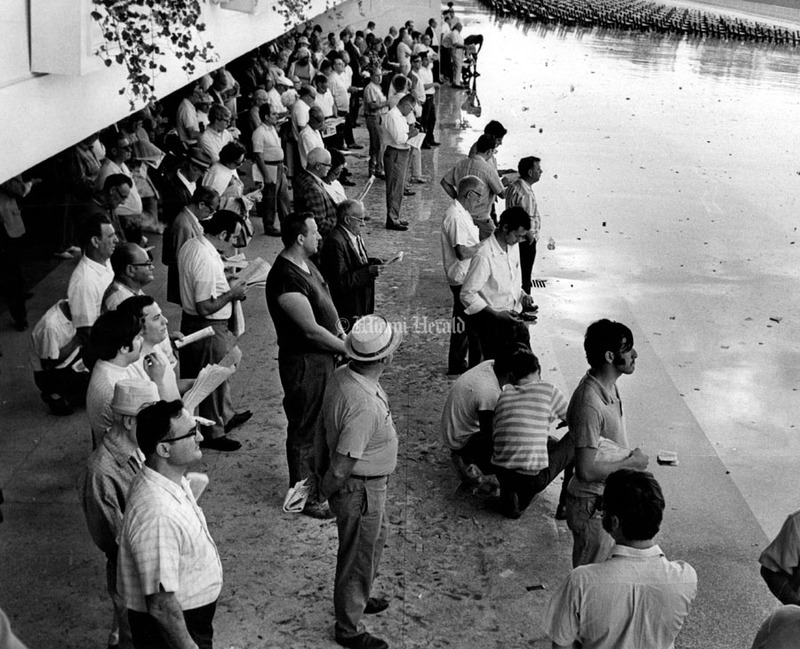 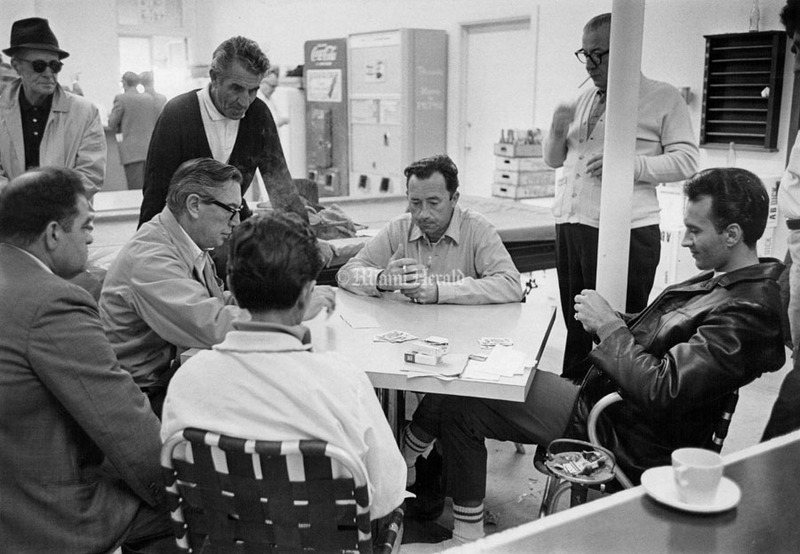 1/25/1969, Bill Sanders/Miami Herald Staff: Hialeah Race Track. 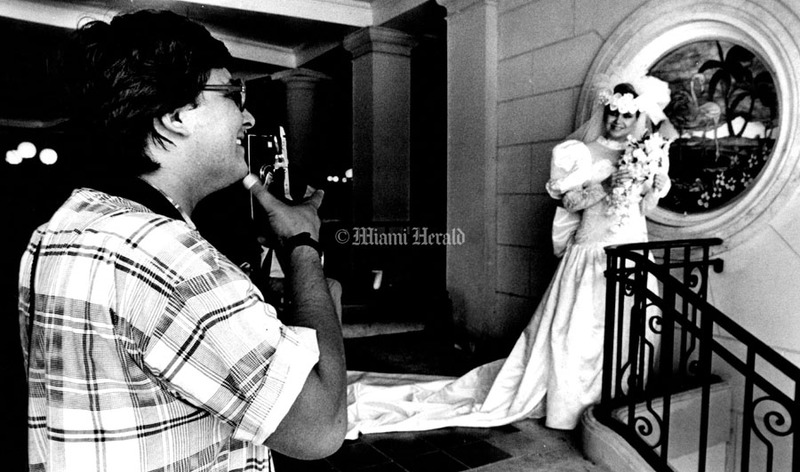 6/15/1989, Peter Andrew Bosch/Miami Herald Staff: Carlos Rangel a photographer for Acosta studios photographing Martha Diaz-Cabrera who is a newlywed taking her picture at the Hialeah park. 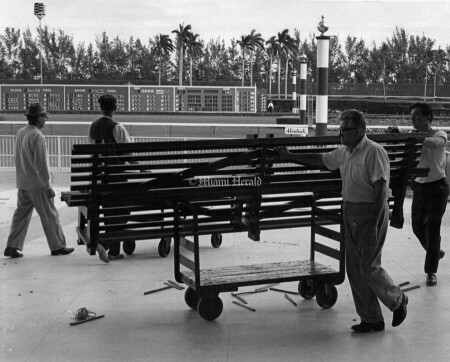 This is one of many activities that take's place that the track during the off season. 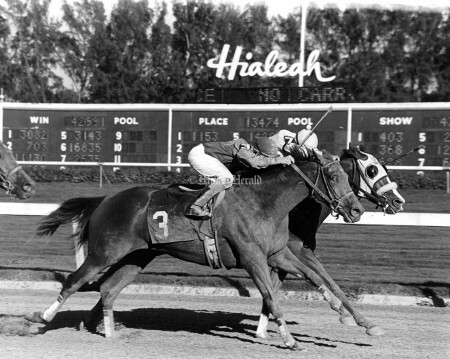 EL SENOR(#6 ) ridden by Jockey Herb McCauley, won the $200,000 guaranteed (Grade 1) Hialeah Turf Cup Handicap at Hialeah Park. The second horse was Frosty The Snowman(#4) Douglas Valiente up. 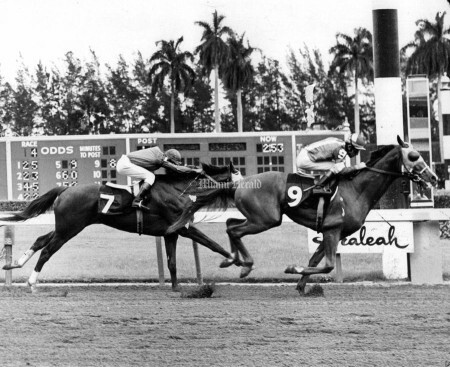 Third place went to COEUR DE LION (#1) with Jean Cruguet up. 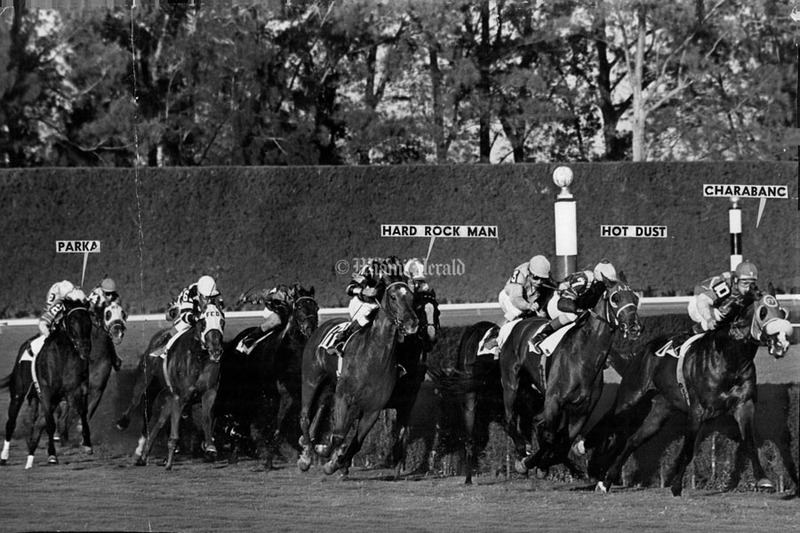 The winner ran the 1 1/2 miles on the turf in 2:25 2/5 setting a new course record. El Senor paid $8.20 to win. 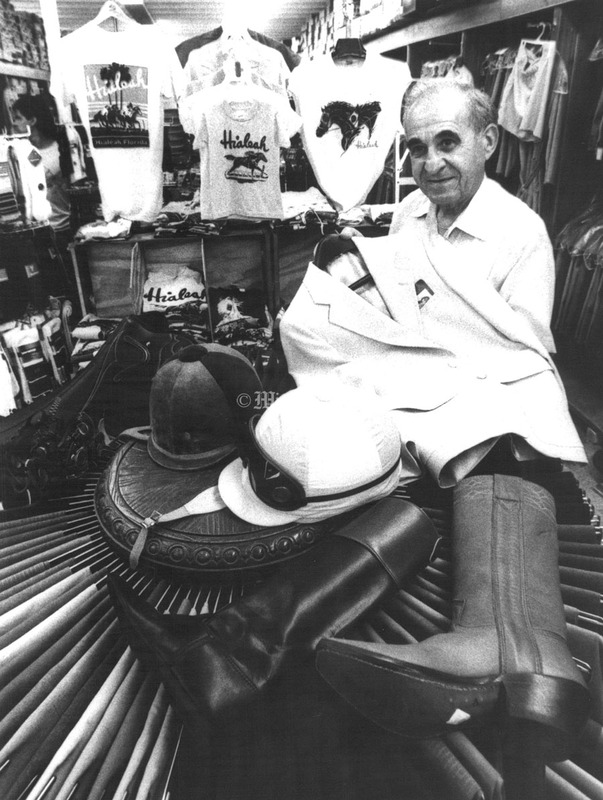 11/9/1987, Brian M. Christopher/Miami Herald Staff: Owner Frank Cohen with some of the down-sized boots, clothing and equipment they sell for use by jockeys. 3/17/1981, Alan Freund/Miami Herald Staff: Hialeah Park. 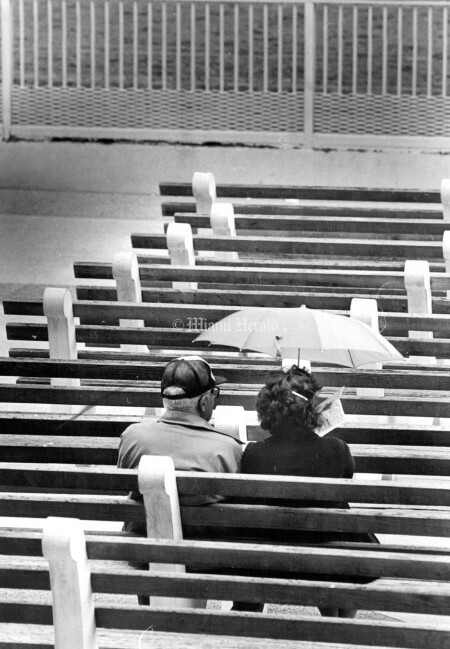 3/6/1987, Aixa Moreno/Miami Herald Staff: This couple was the only one to brave the drizzling rain. 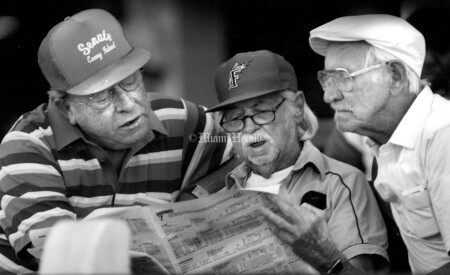 Undated, Carol Guzy/Miami Herald Staff: Basil Conner (left) & Pete Artell (Rt.) 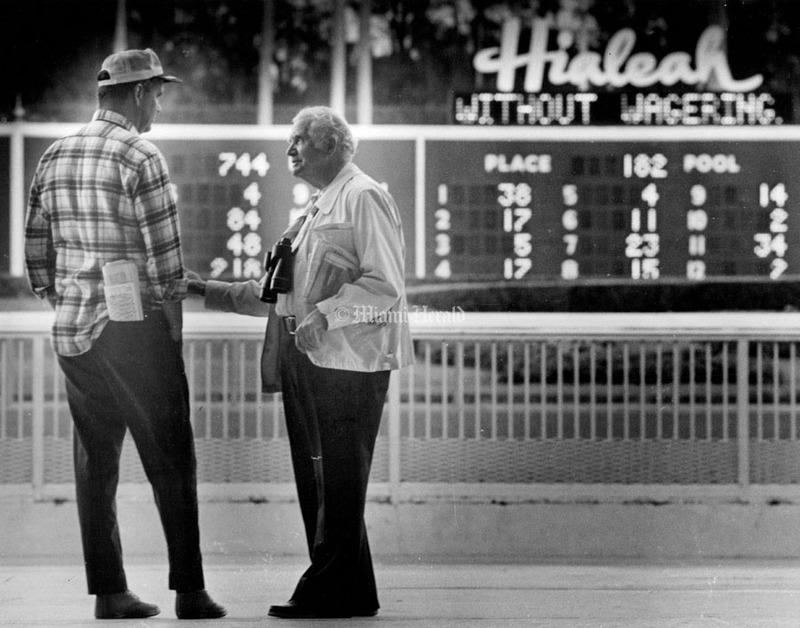 at Hialeah race track without betting. 1/30/1965: Lolly Dragoon (right) Flashes home. 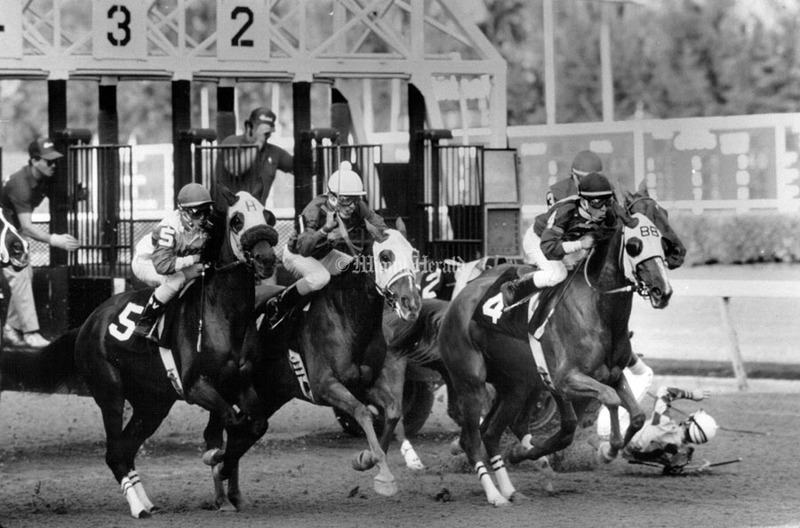 Trial orbit second in Friday opener. 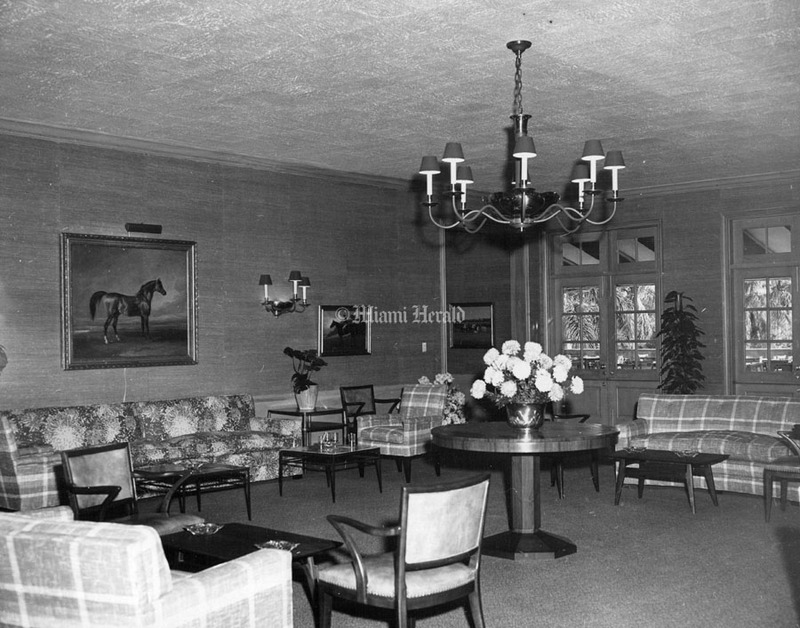 3/7/1979, Bob East/Miami Herald Staff: Hialeah is still pretty elegant - at least at the clubhouse entry way. 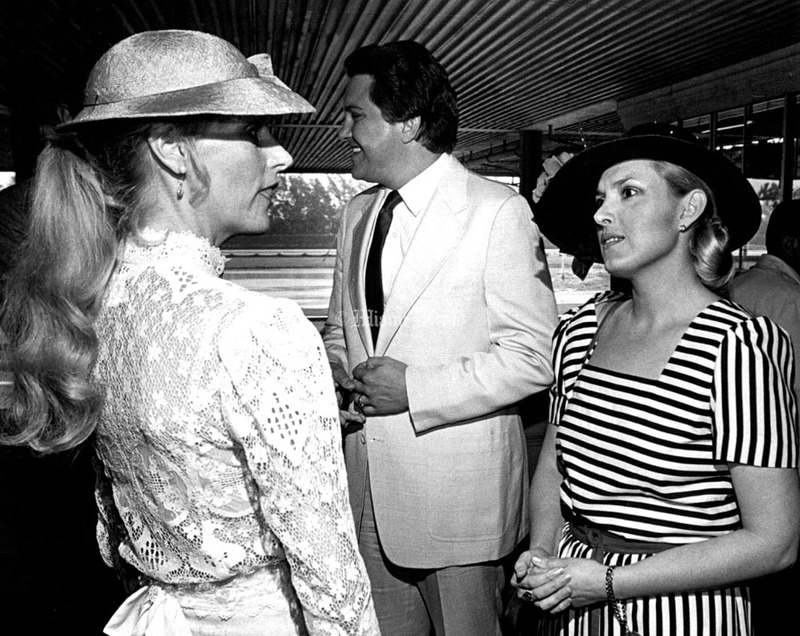 1/1/1983, Albert Coya/Miami Herald Staff: Barbara Mann talks to Angela Martinez, in the back major of Hialeah Raul Martinez. 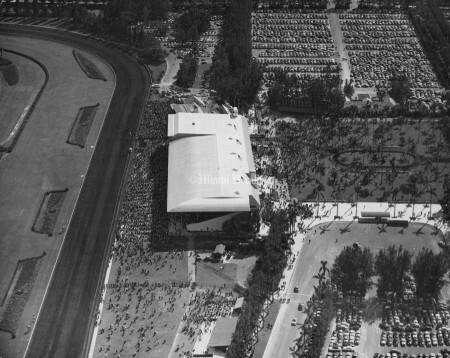 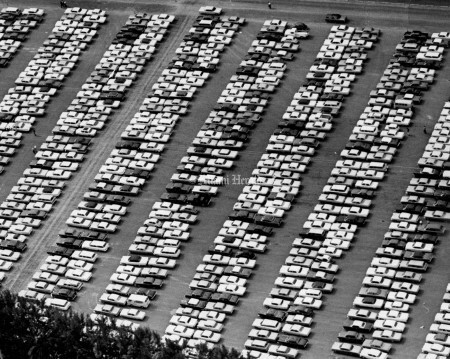 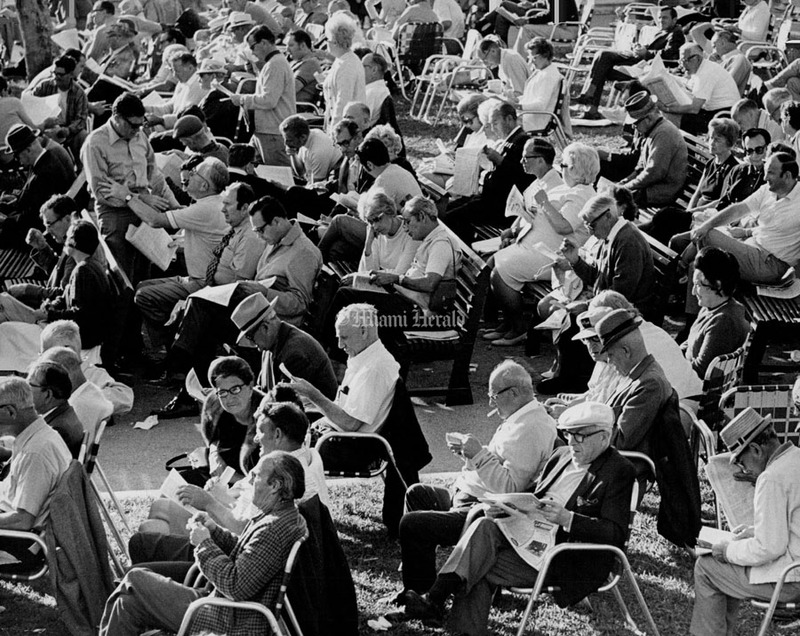 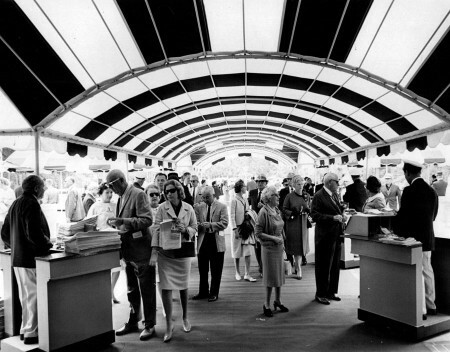 1/17/1975: Large opening day crowd on hand on first day of Hialeah Park's 50th anniversary meeting. 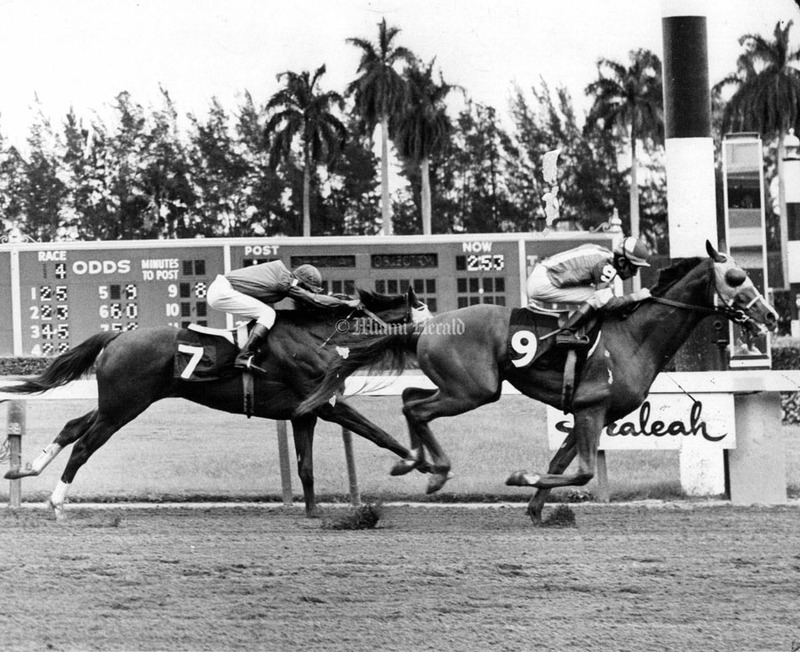 Race was won by Classical Blue ridden by Jean Cruguet. In 2nd place was Madam Gracie with Mickey Solomone up. 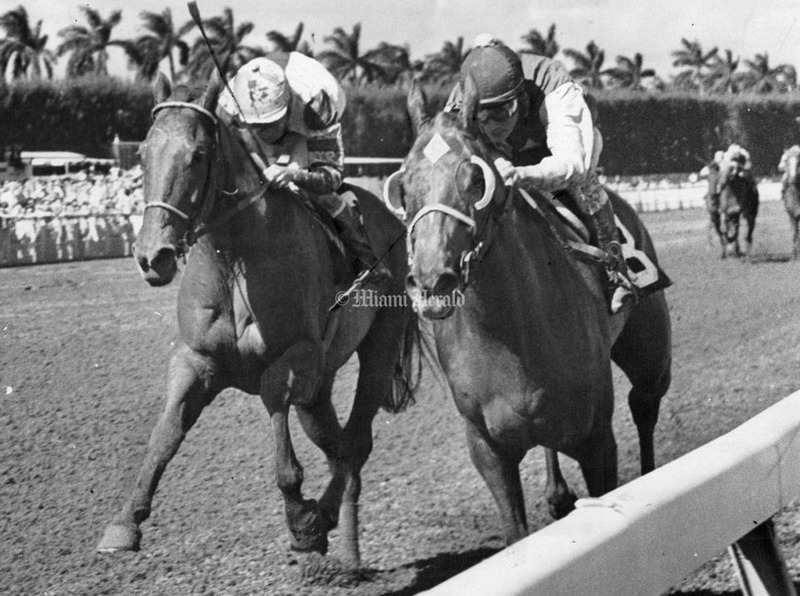 Mosquito Lane finished 3rd with Nicanor Navarro up. 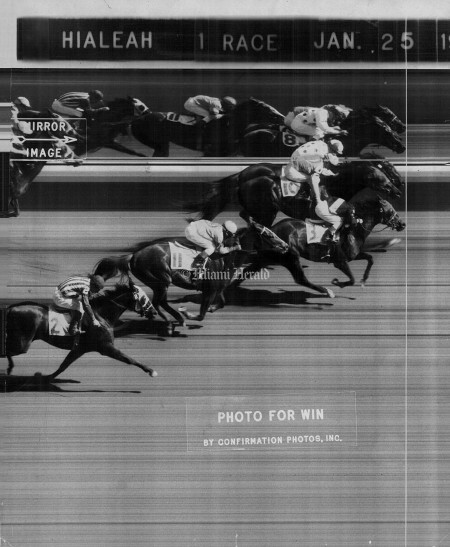 Winner ran 6 furlongs in 1:10 2/5 and paid $10.80. 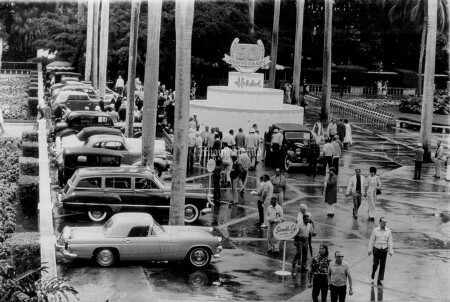 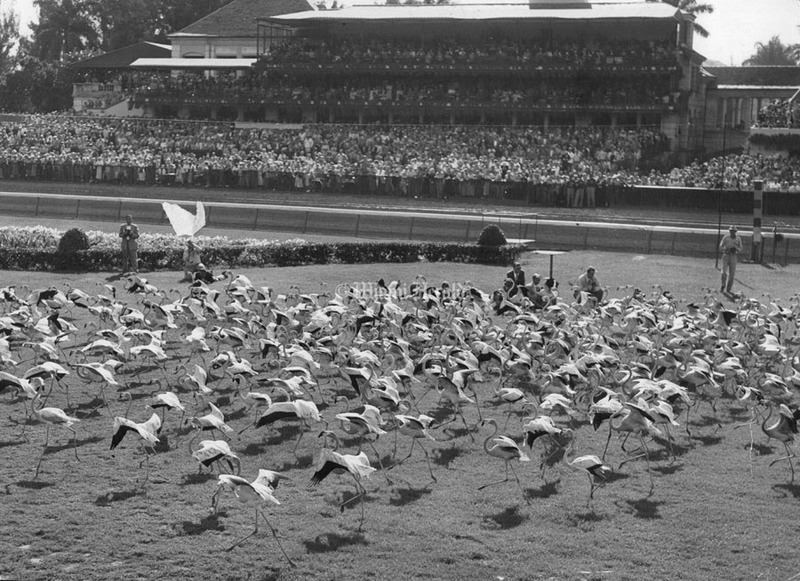 1/1/1950, Miami Herald Staff: Flamingo's parading at Hialeah Stadium, Flamingo Day. 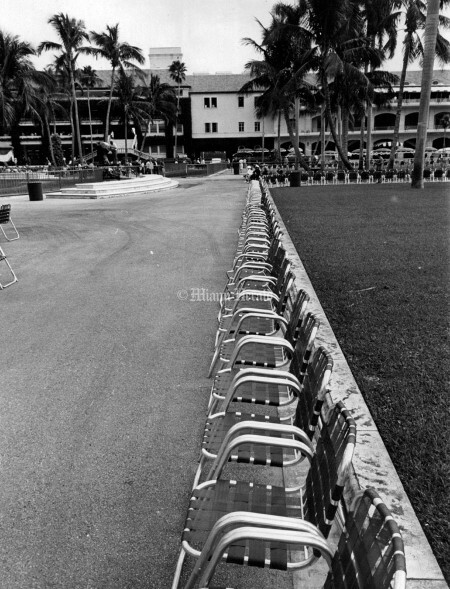 4/4/1986, Robin Cohen/Miami Herald Staff: Starting line at the Flamingo. 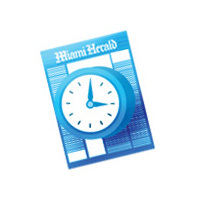 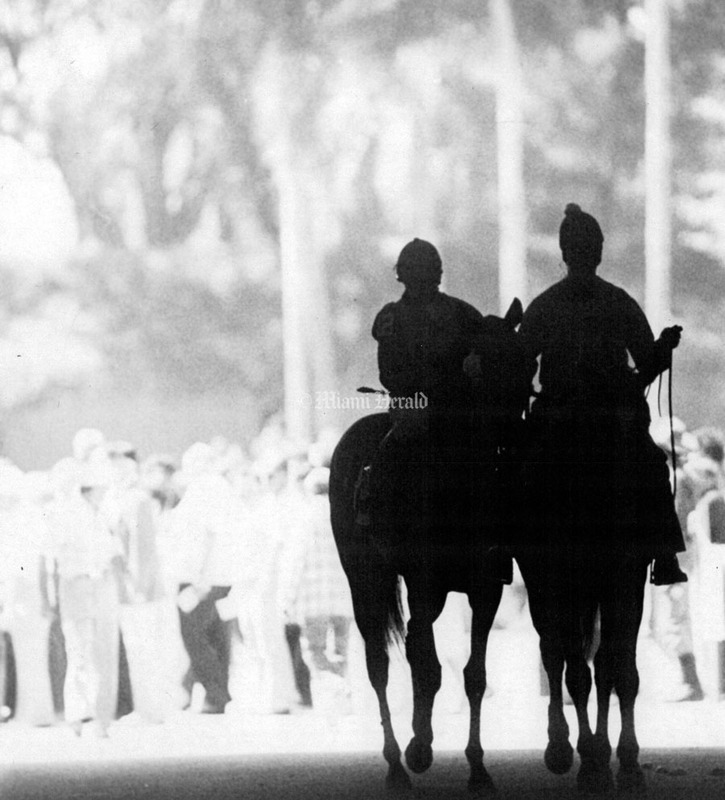 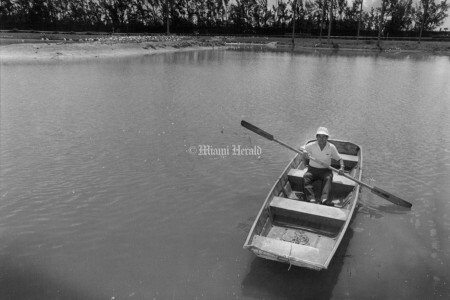 3/7/1981, Joe Rikmus Jr./Miami Herald Staff: Horses head out to lock. 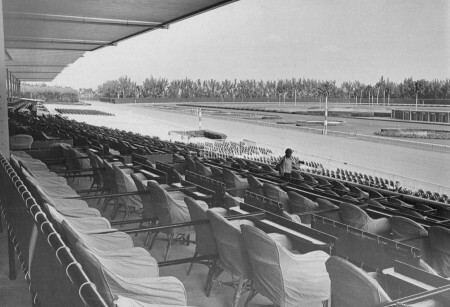 Hialeah Race Track. 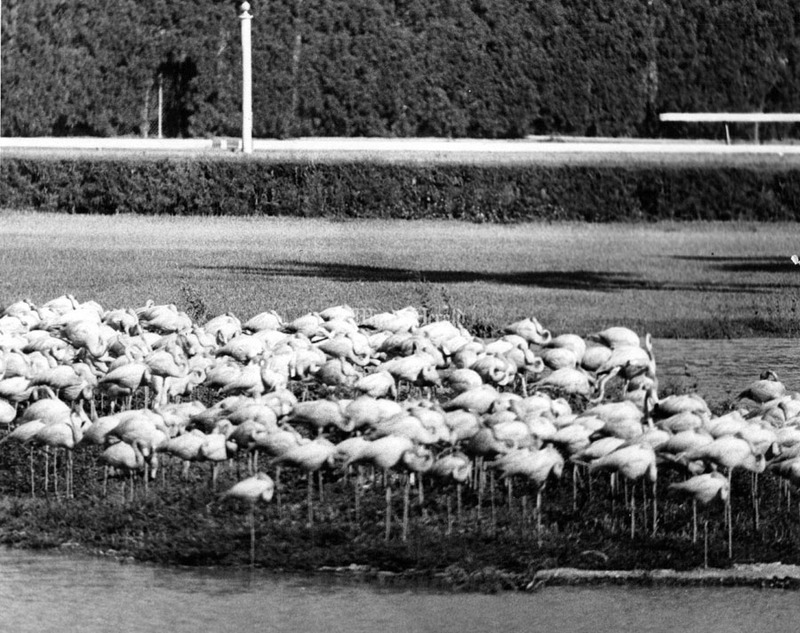 5/9/1991, Peter Andrew Bosch/Miami Herald Staff: Flamingos that are sitting on nest's at the Hialeah Park. 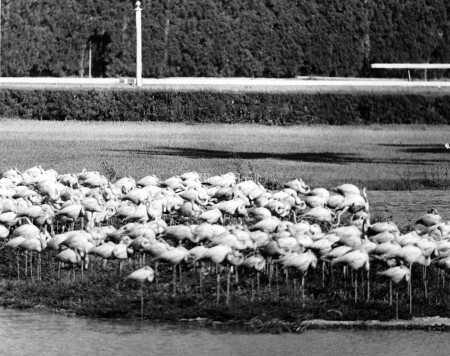 They bred so well the Florida aubudon society declared the park as sanctuary. 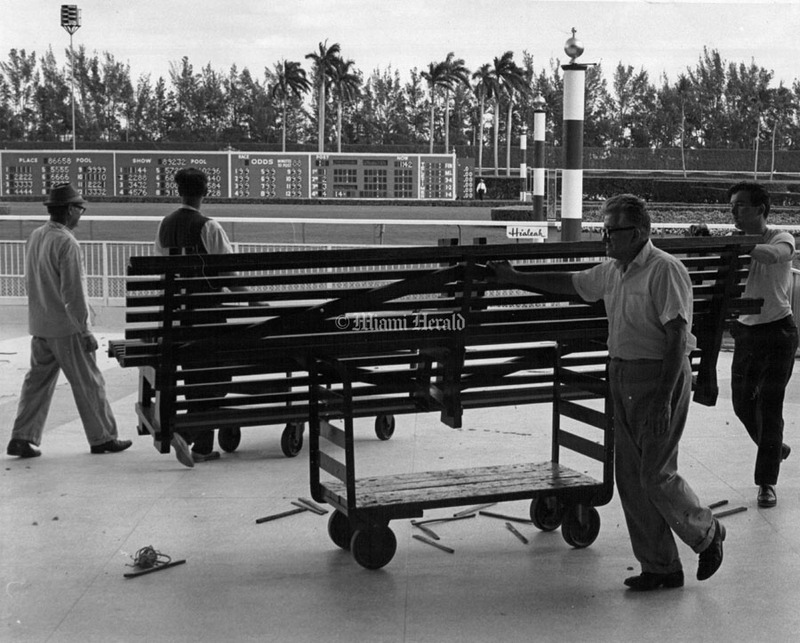 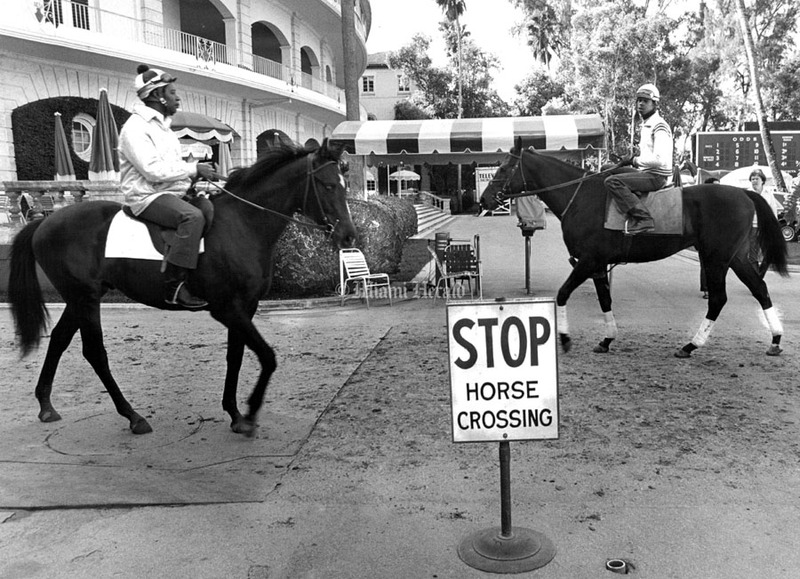 Undated: PRANCING THOROUGHBREDS get the once-over from patrons of one of Miami's famed horse tracks before going to the post. Thousands are in attendance at the tracks daily during the racing season and wager millions on their selections. 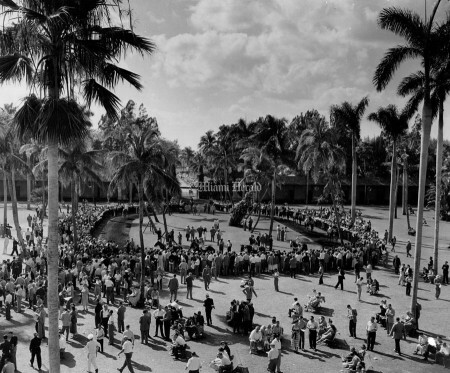 1/16/1965, Bob Crowds surge into clubhouse at Hialeah. 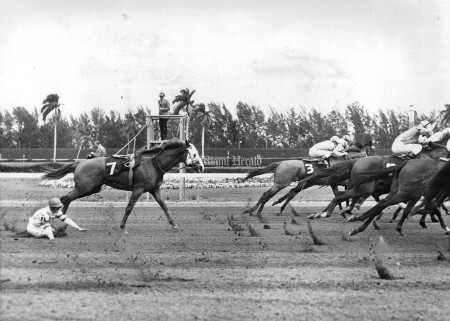 1/10/1965, Bob East/Miami Herald Staff: At feet of citation are Eddie Arcaro and Jimmy Jones. 1/15/1956: VIEWING A MODEL, the scale kind sans shapely legs, are the new owners of Hialeah Race Course - Eugen Mori, left, the president and his son Eugene, Jr., treasurer. 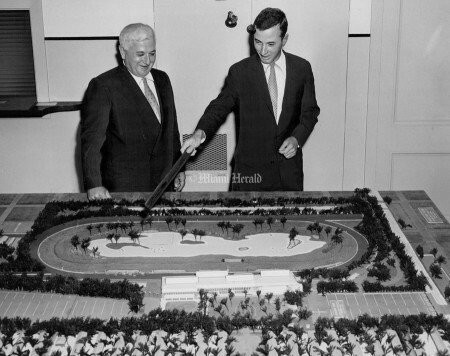 The younger Mori points out some of the million dollar improvements which will make the track the showplace of the South when it opens Tuesday. 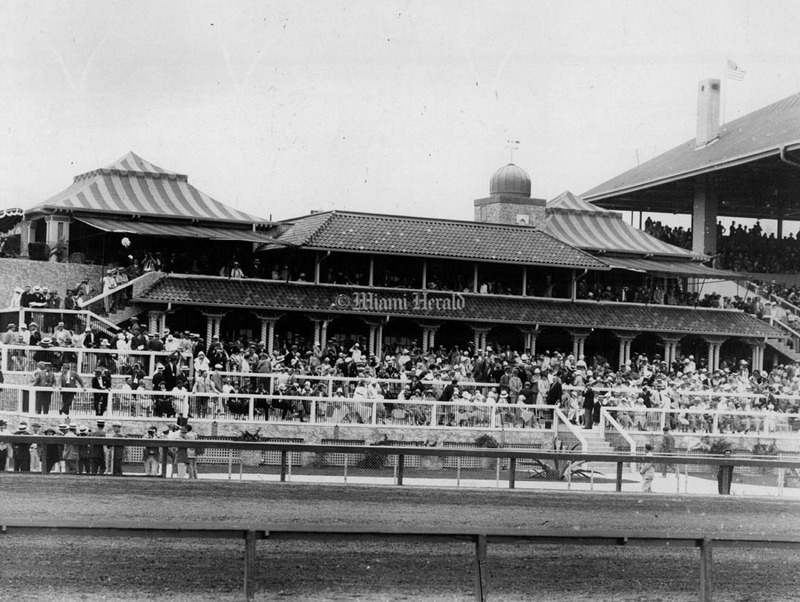 1925: Grand Stand Hialeah Horse Race Track. 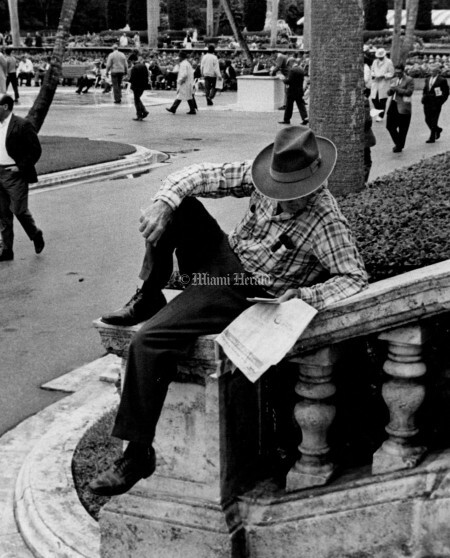 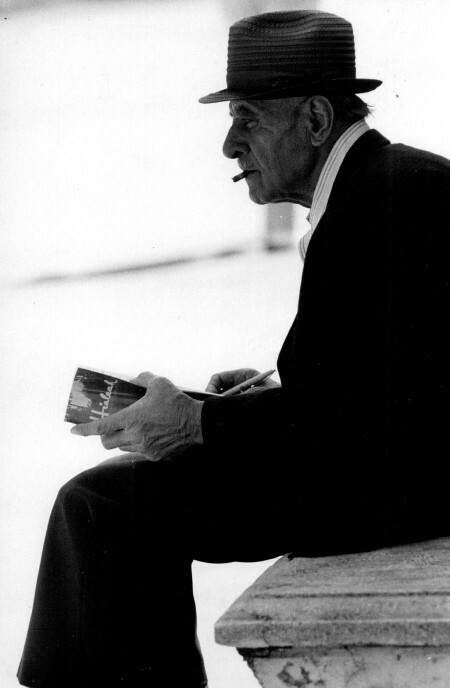 2/1/1964, Bill Sanders/Miami Herald Staff: Bouganvillea Turf Hardicap. 3/17/1953, Miami Herald Staff: HIALEAH CLUBHOUSE BURNED -- ON PURPOSE. 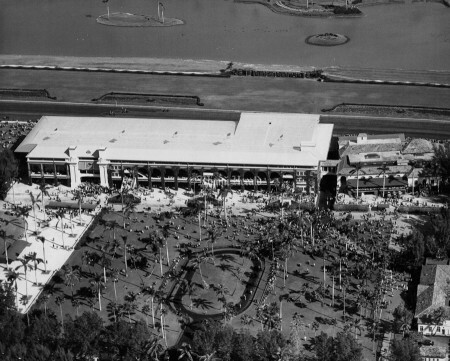 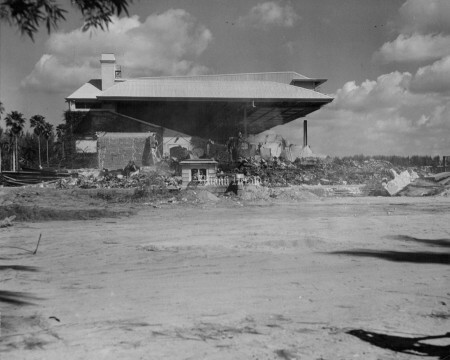 Hialeah park's million dollar clubhouse was burned down Mar. 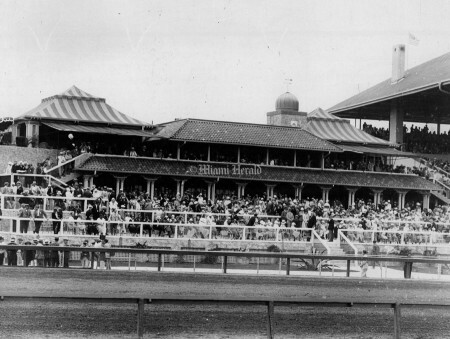 17th., to make way for a new 2 million dollar clubhouse to be erected before next racing season. Burned was a large pile of rubble, all that remained from the wreckers, and firemen from four departments watched so that the nearby grandstand didn't become damaged. 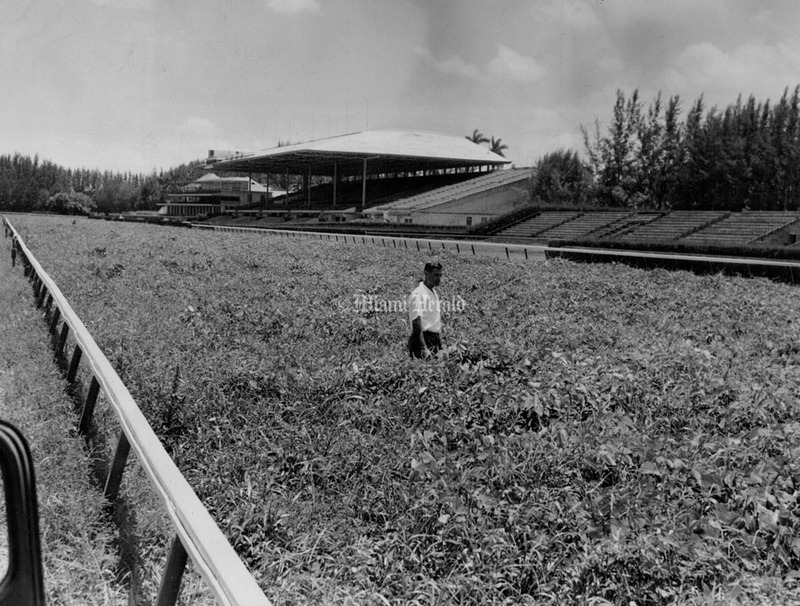 7/8/1945, Miami Herald Staff: JOE MORROW, superintendent of the Hialeah Race course, is shown inspecting the most famous pea patch in the world. 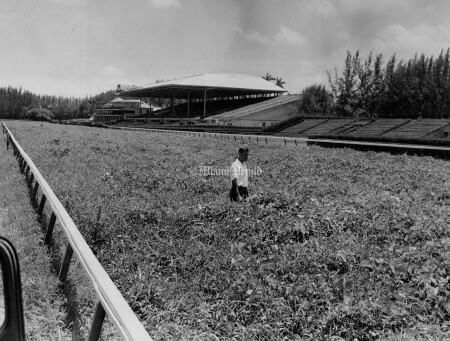 Peas which were planted on the Hialeah racing strip have been bearing in abundance. 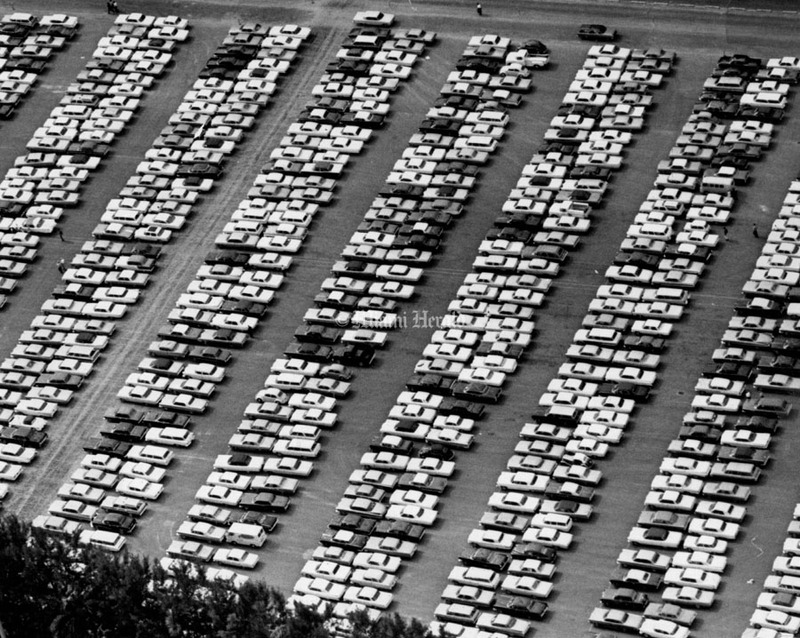 Later they will be plowed under. 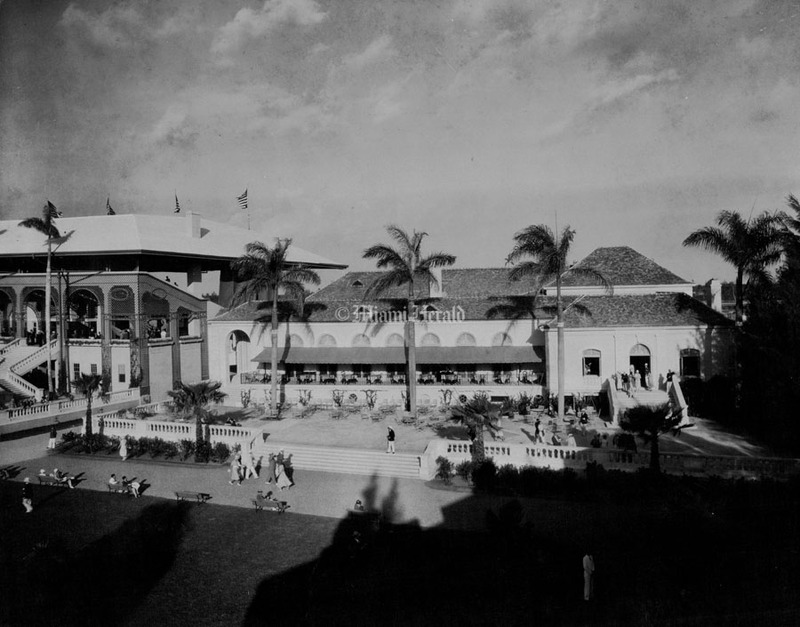 1925: The old clubhouse Hialeah Park. 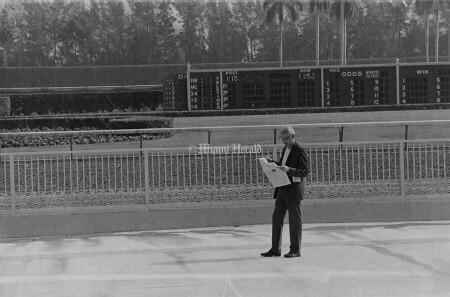 3/7/1981, Joe Rimkus Jr./Miami Herald Staff: George Barod at Hialeah Race Track. 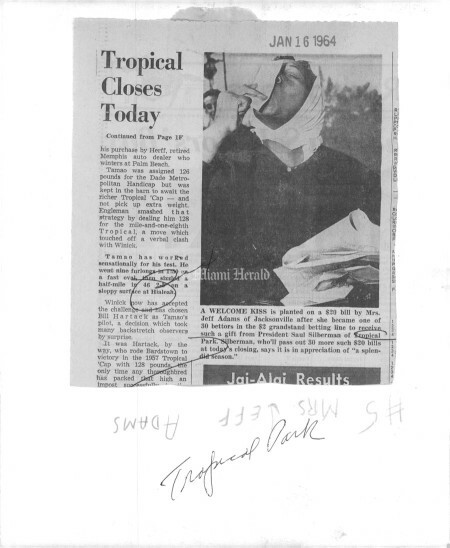 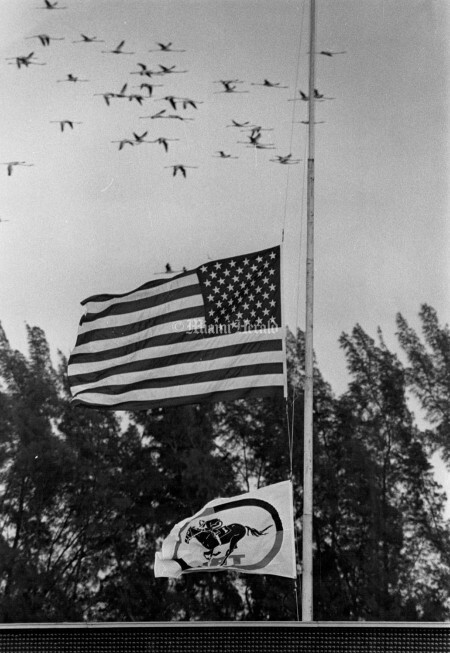 1/1/1978, Bob East/Miami Herald Staff: The flamingoes are flying, so Hialeah must be open here over the tote board and flag at half mast. Undated: A small section of the dining room which seats 73 persons. 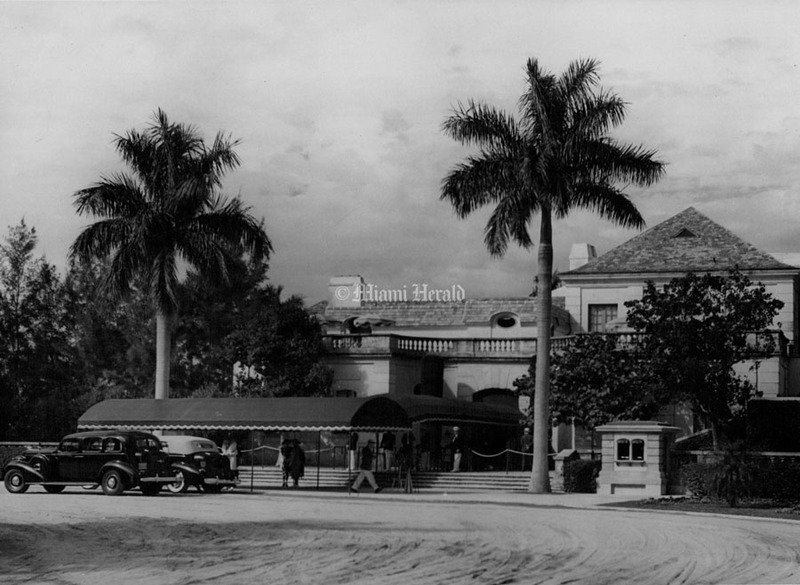 1925: Hialeah Clubhouse, 1925 Season. Undated: The director room on the third level walls are decorated by historic racing paintings. 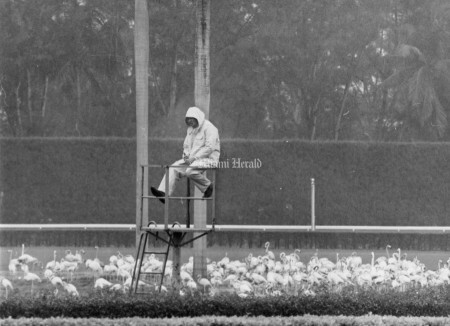 1/18/1975, Miami Herald Staff: Hialeah Race Track. 1/26/1965: Close! It was a deadheat for first money in Hialeah's opening race and missed by a nose of being a triple "Heater." 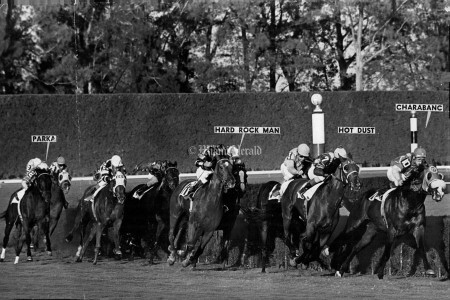 Alphine Bay (3) and Dalmar (8), piloted by Hedley Woodhouse and Gene Monacelli, respectively, shared first money, and Nance's Lad, Jr., (10) missed by a nose under Jack Leonard. 2/11/1970: Horse Race Track Hialeah. Jockey Charles Maffer takes a tumble. 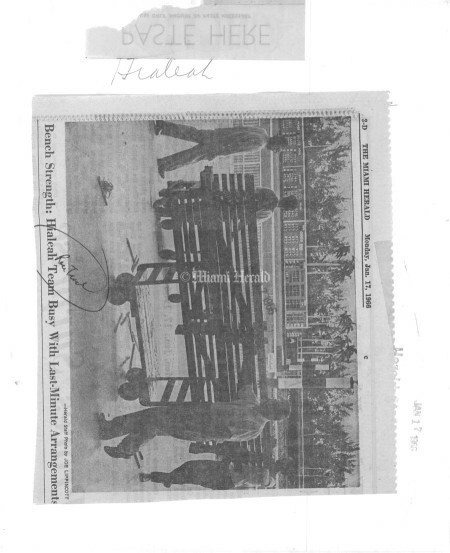 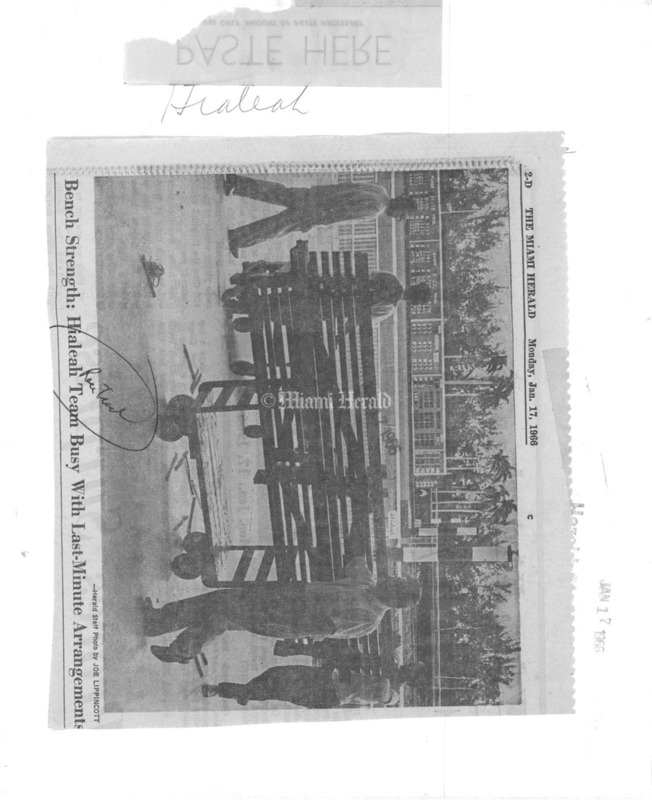 1/23/1968, Miami Herald Staff: DOUBLE SPILL AT HIALEAH..Jockey Larry Adams is assisted by track vet. 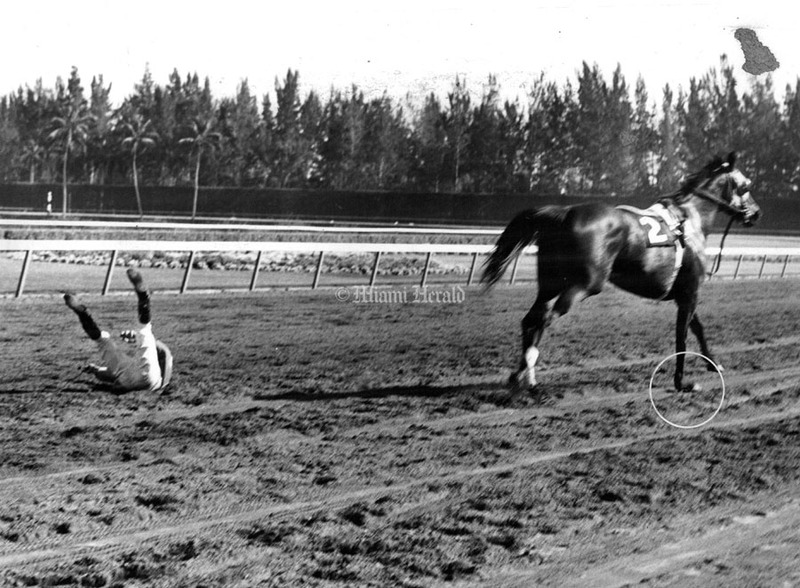 John DeMilly after his mount ED Farrell (rear) broke his right foreleg when running in 2nd place in final strides of first race at Hialeah. 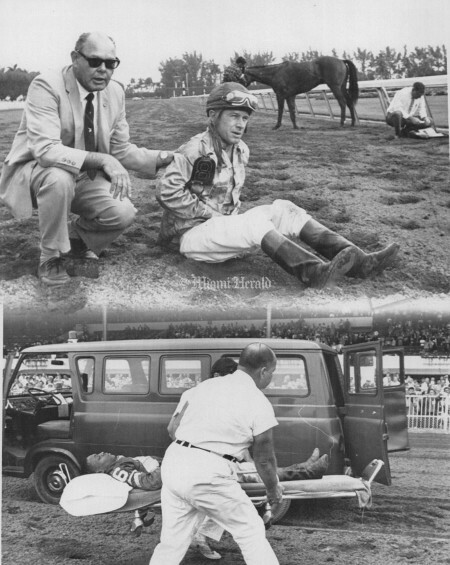 Lower photo shows jockey Ronnie Tanner being moved to first aid. 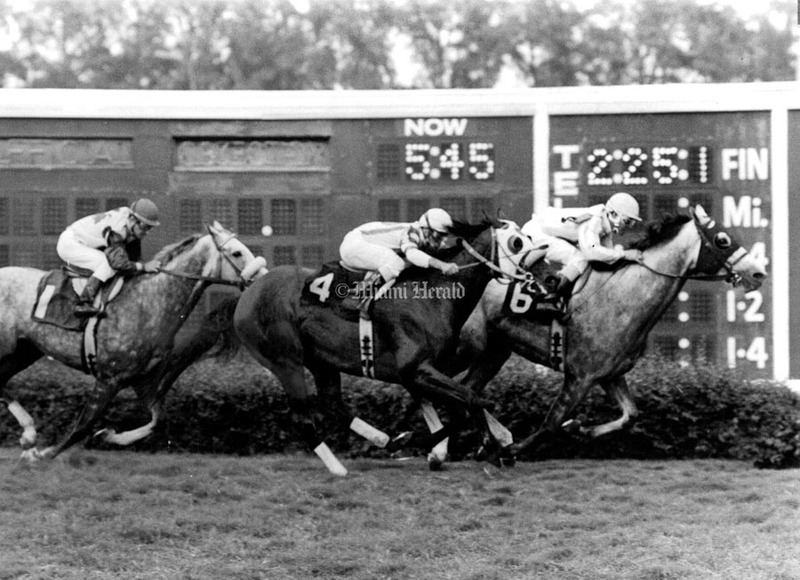 His mount Needy Fellow swerved to avoid Ed Farrell. Neither rider was seriously hurt but cancelled remaining mounts on card. 3/4/1972: Horse Race Track - Hialeah. 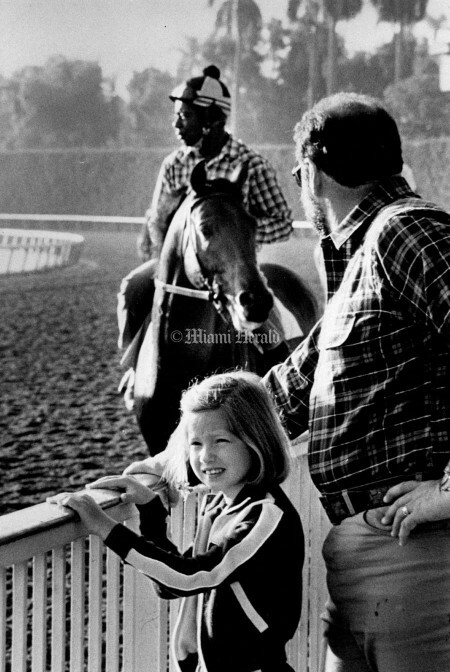 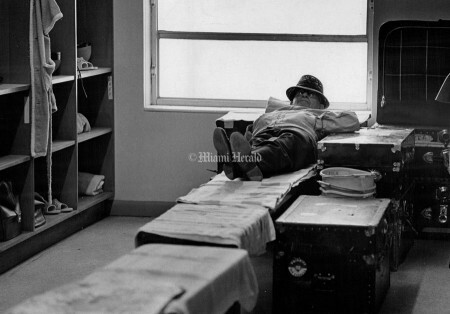 12/30/1987, Jim Rafferty/Miami Herald Staff: Hialeah Park. 1/4/1992, Bill Frakes/Miami Herald Staff: Fans cheer as Willie Chirino performs at Hialeah Race Track. 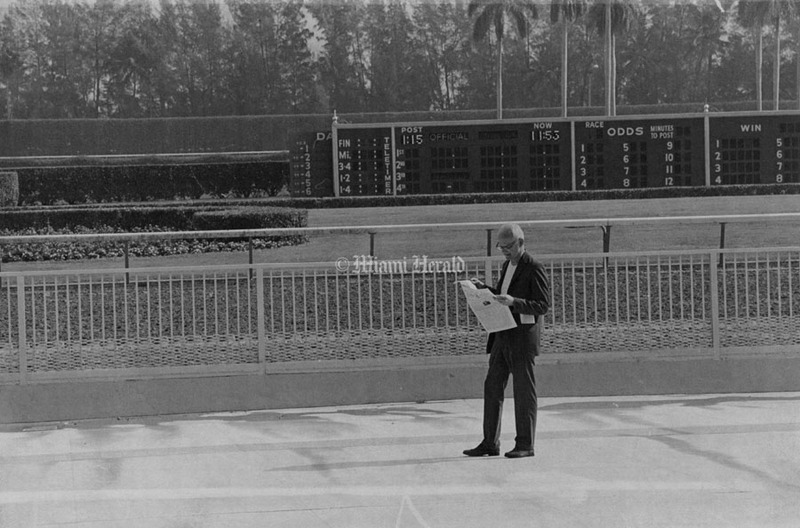 Undated, Michelle Patterson/Miami Herald Staff: Jael Cue, 15, of Hialeah, has her portrait made by Juan Demesa of Demesa Studio at the Hialeah Race Course in the Clubhouse. 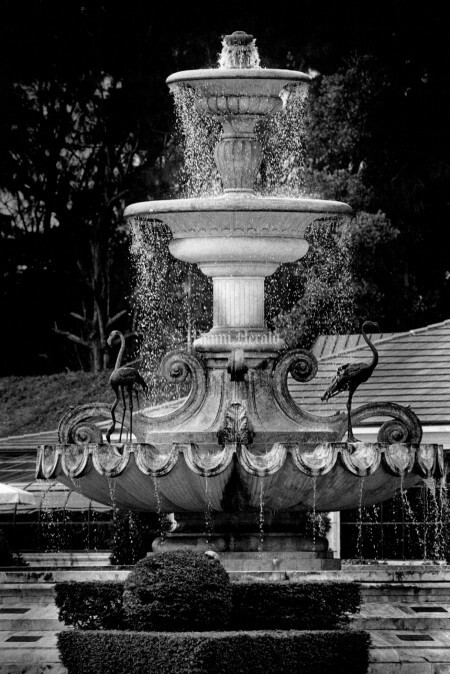 Cue was having her Portrait made for Los Quinces or her fifteenth Birthday. 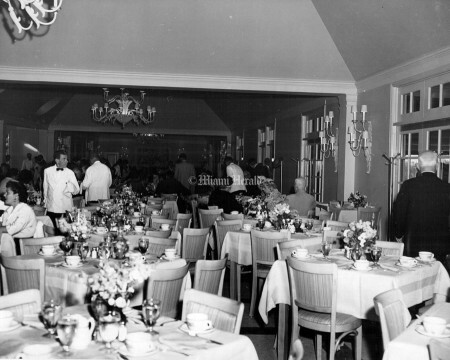 Cue and other Quinceañeras said they thought the clubhouse was beautiful and Demesa said he brought subjects there all the time to photograph and that he was glad the place is reopening and is restored. 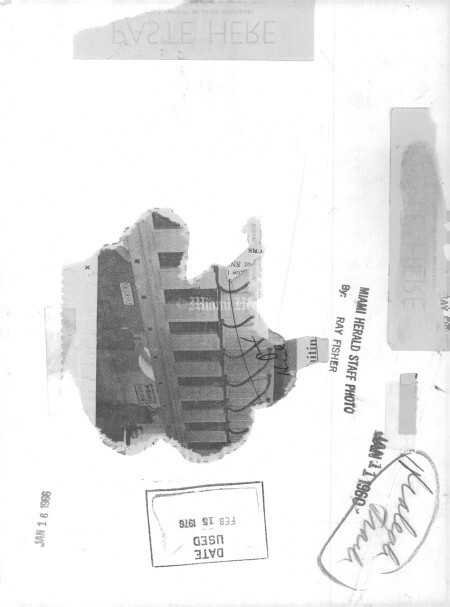 11/10/1991. 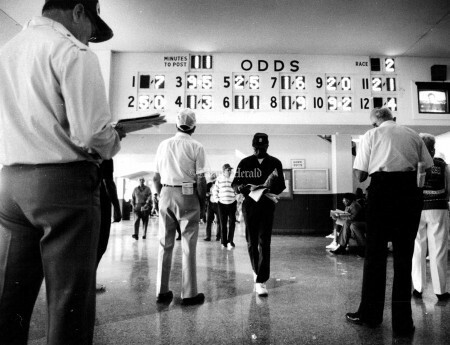 Jeffrey Slater/Miami Herald Staff: Fans check out the odds on race #2 during opening day at Hialeah Park. 5/5/1986: BUCKCHANCER WINS 5TH RACE On the first day of twilight racing, Jaun A. Santiago piloted Buckchancer (no.1) to win the 5th race. 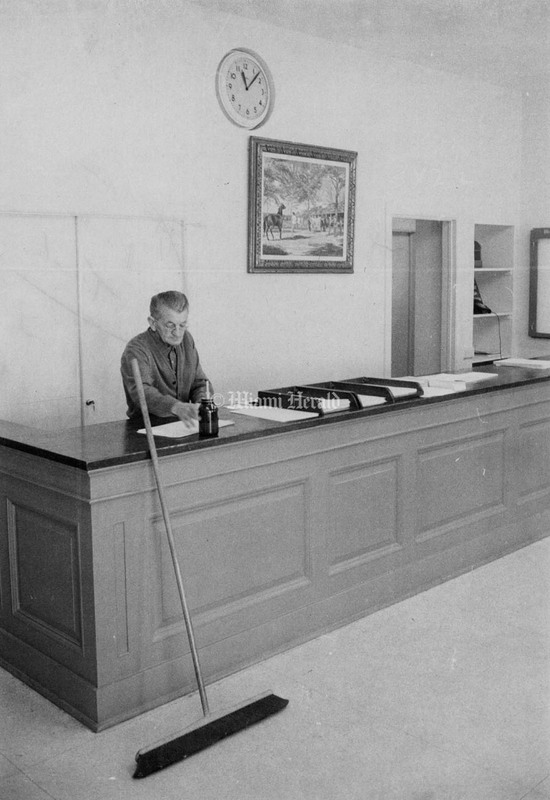 2nd money went to Hasty Fellow (no. 5) with Robert Breen aboard. 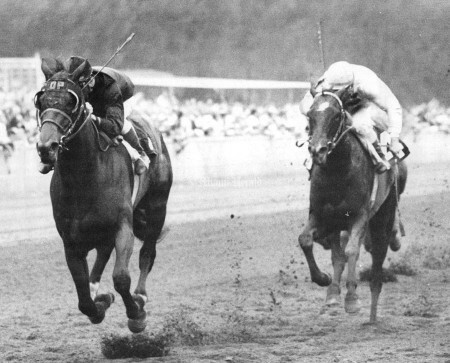 In third place was Tatupu (no. 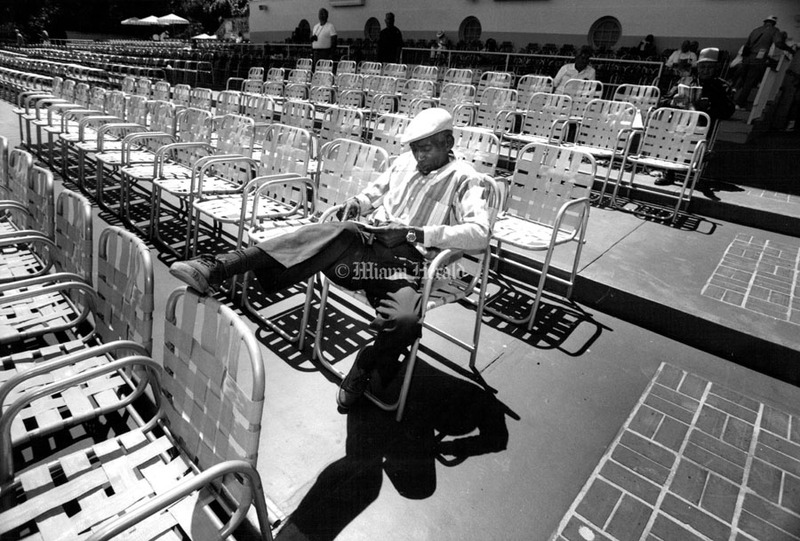 4) and James Terry up. 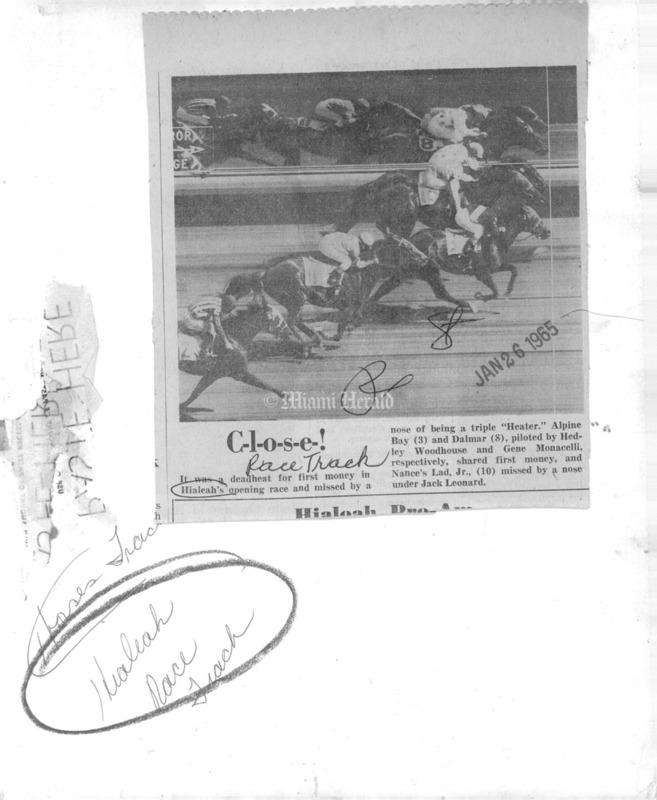 The winner ran the 1 1/8 Mile test in 1:53 1/5 and paid $8.60 to win. 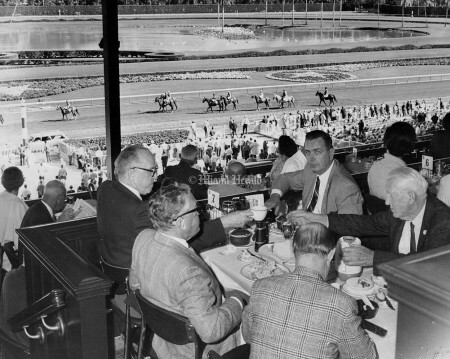 Undated: Delightful dining on the Flamingo Terrace at Hialeah Park. Your table is your box seat for the afternoon right on the finish line. 5/19/1994, Peter Andrew Bosch/Miami Herald Staff: At Historic Hialeah park there are still some who can give testimonials of what racing there one was, Tony Forrest, is a long-time regular at the track.